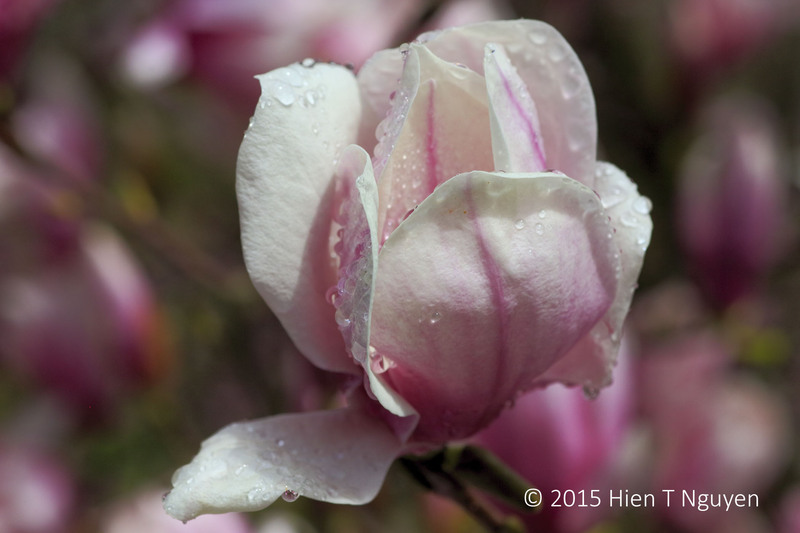 Spring is winding down as flowers, reinvigorated by recent rain, strive to put on their best shows. 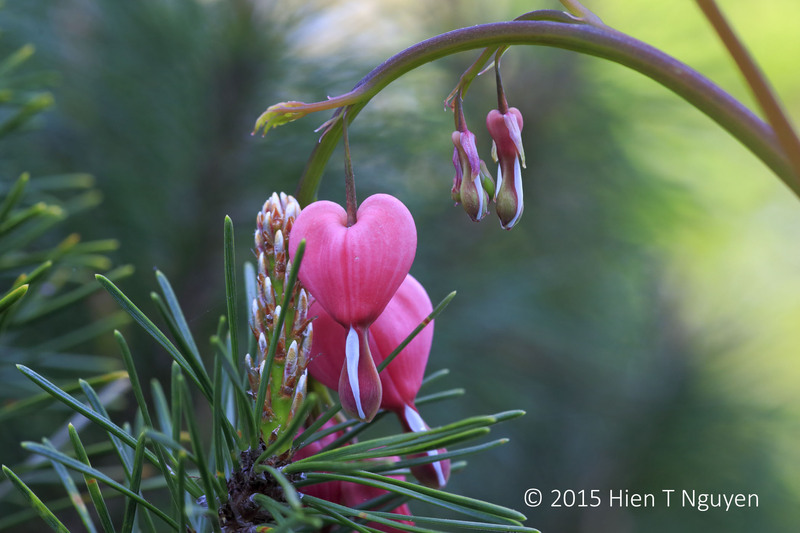 I took the following photos over the past few days around our backyard. 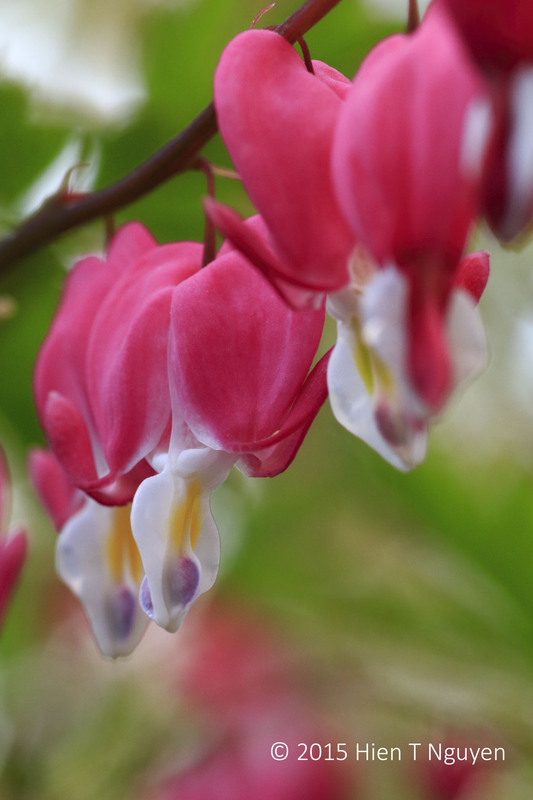 Please let me know in your comments which ones you would prefer. 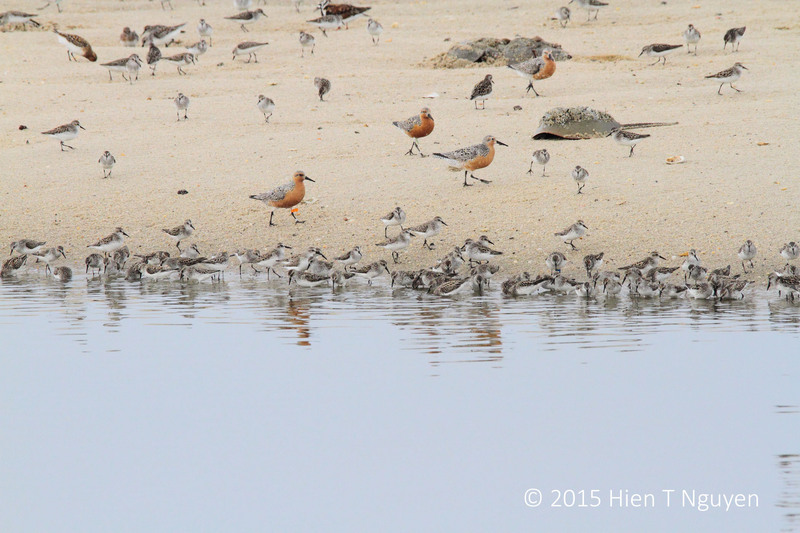 Yesterday I went with a friend back to Fortescue, NJ to see Red Knots and other shore birds feasting on the eggs that Horseshoe Crabs come ashore to lay in late May of each year. There seemed to be many more birds, and millions of mosquitoes, this time. 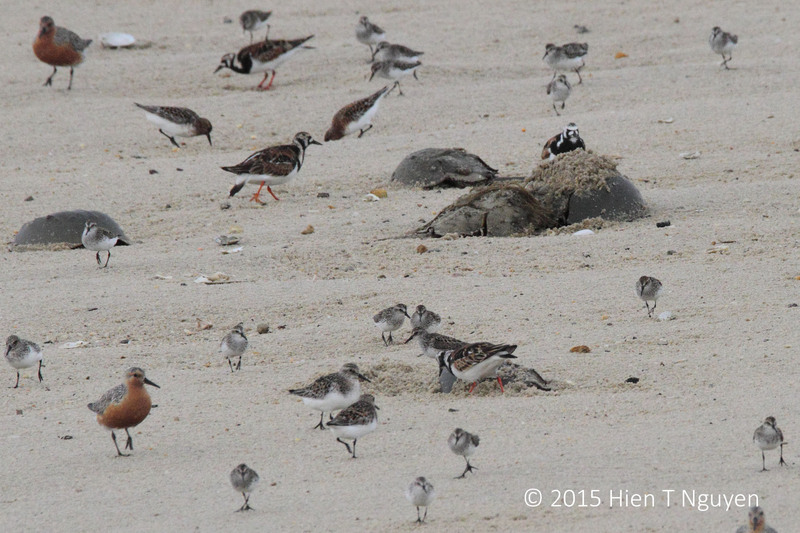 Horseshoe Crabs, Red Knots, with orange breast, Semipalmated Sandpiper, and Ruddy Turnstones in the background. 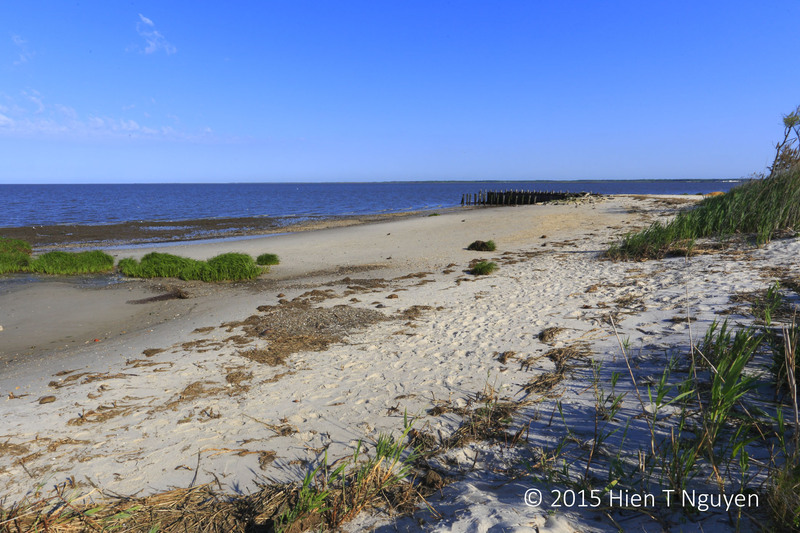 Horseshoe Crabs, Ruddy Turnstones, Semipalmated Sanpiper, Red Knots. Three male crabs were converging on one female. The males are usually smaller than the female crabs. 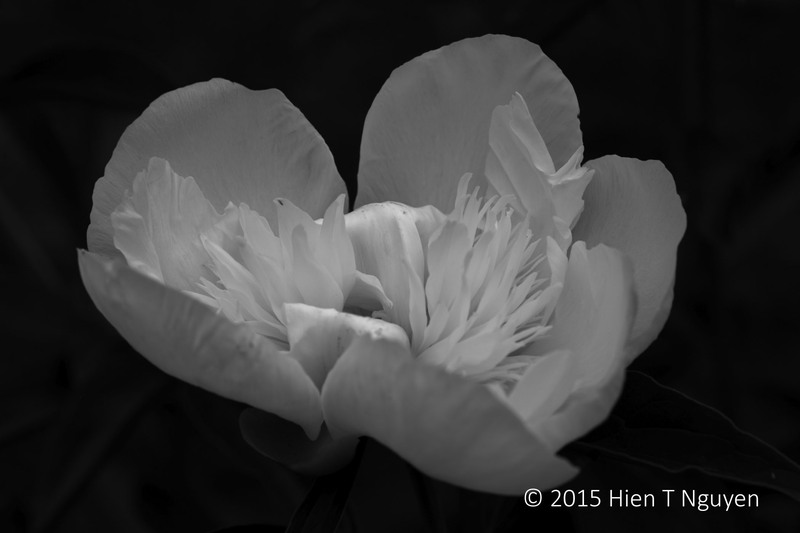 The following photo could be used as a wallpaper pattern. Shore birds walking on the beach at Fortescue, NJ. There was a group that was capturing Semipalmated Sandpiper with nets to later band them for help in studying their population and migration patterns. 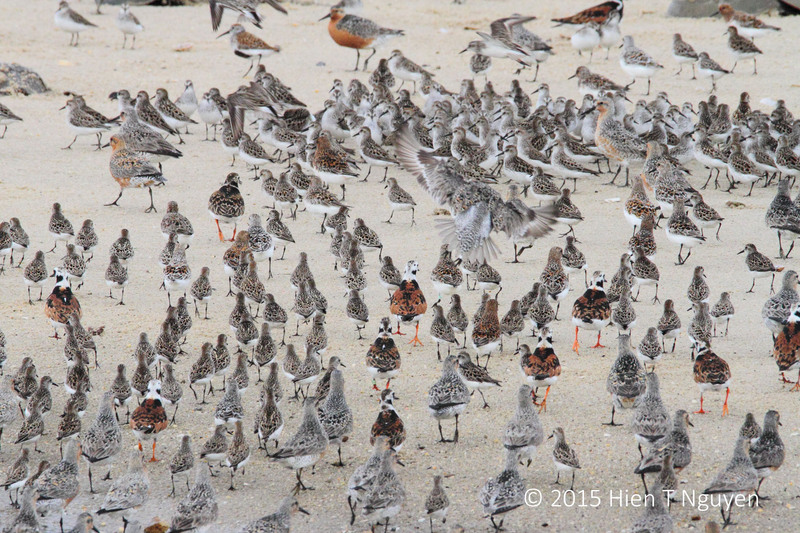 There are claims that Semipalmated Sandpipers are in decline and their population should be “of concern.” These birds, like the Red Knots, can fly nonstop 2,000 miles from South America to New Jersey where they rest and replenish their energy with the help of crab eggs. 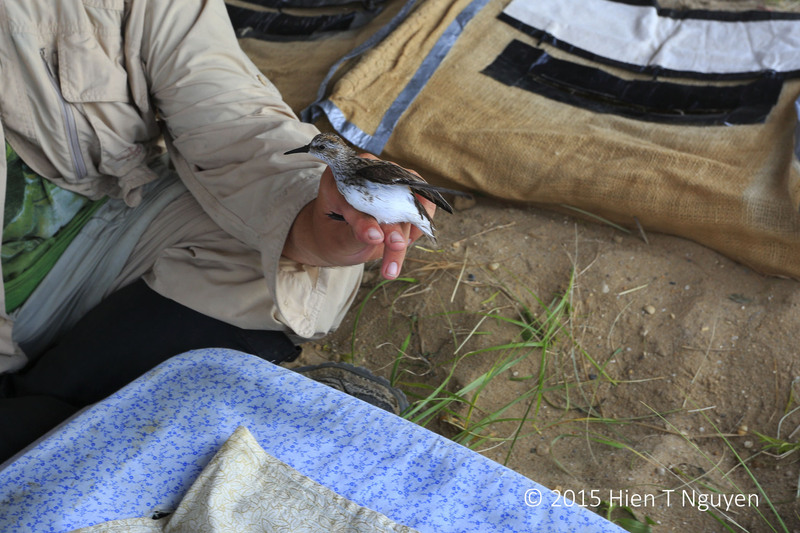 Captured Semipalmated Sandpiper being transferred from one container to another. 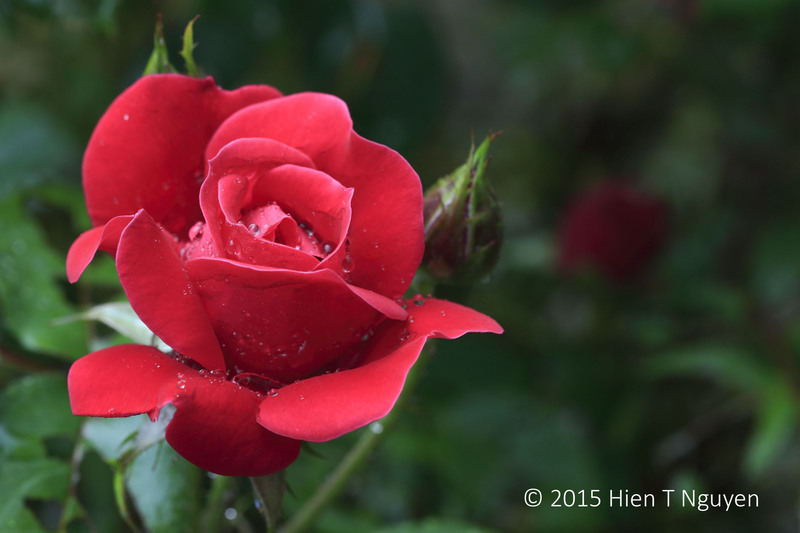 In May of this year, we had 25 days without rain, a record for our area. There was talk about drought, water shortage and what not. 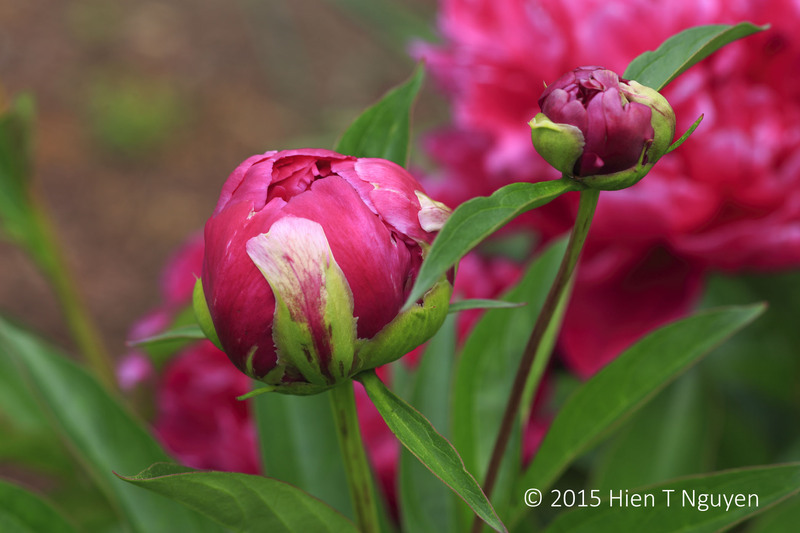 Even the flower plants were not doing as well as in previous years, and peonies were late. 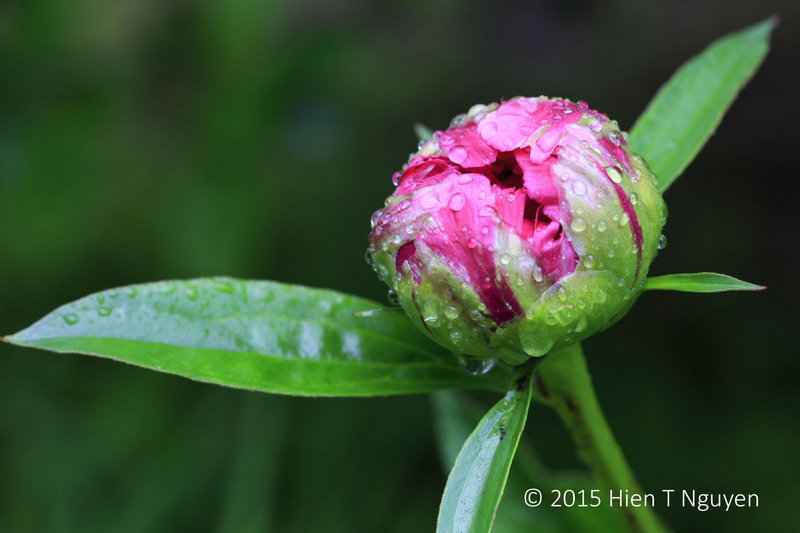 Then yesterday the rain came, lots of it. 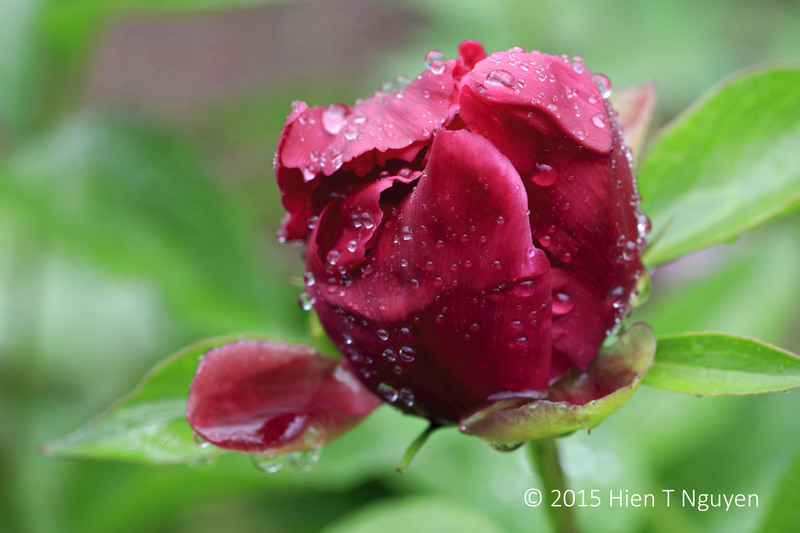 During a brief lull, I ran out and took pictures of peonies and roses covered with rain drops. 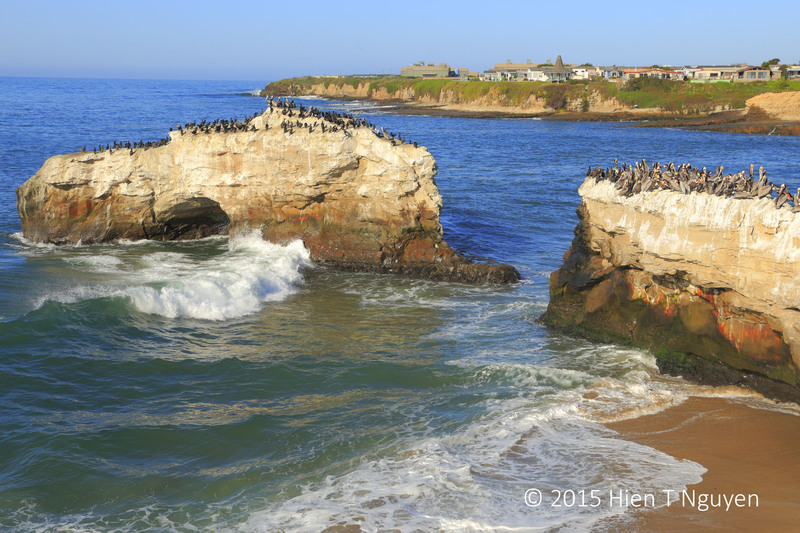 The following photo is of a natural bridge at Natural Bridges State Beach in Santa Cruz, CA. It is the only one remaining of three natural arches carved by the sea into a cliff over a million years ago. As you can see, the waves show no mercy on this natural structure. The outermost arch fell down in the early 20th century, and the innermost one collapsed in 1980. It is expected that the remaining arch will also break down eventually, perhaps sooner than we think. 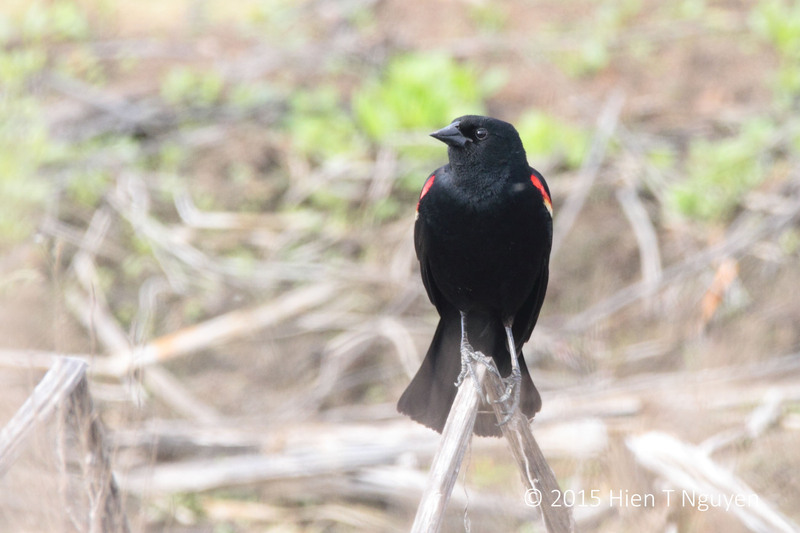 Spring means mating season for many birds, and to be at their best their feathers change to more vivid colors, their breeding plumage in other words. 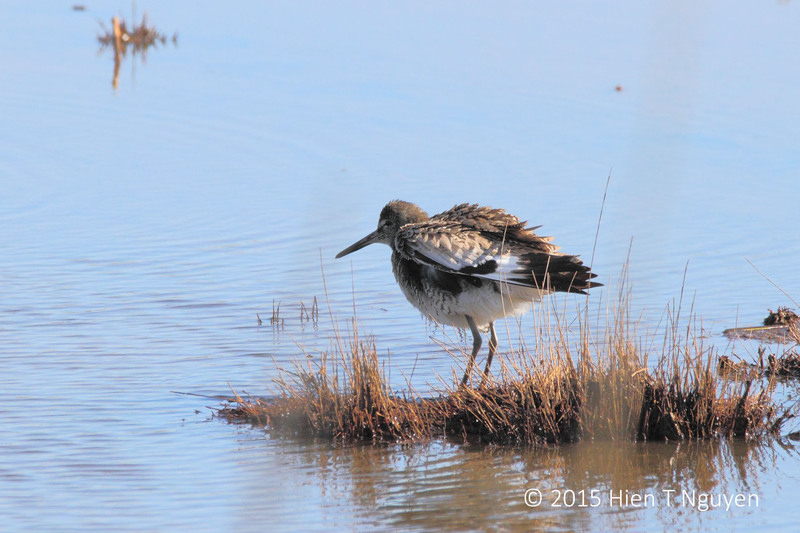 Here are a few photos of this phenomenon taken at the Edwin B Forsythe National Wildlife Refuge within the past two weeks. 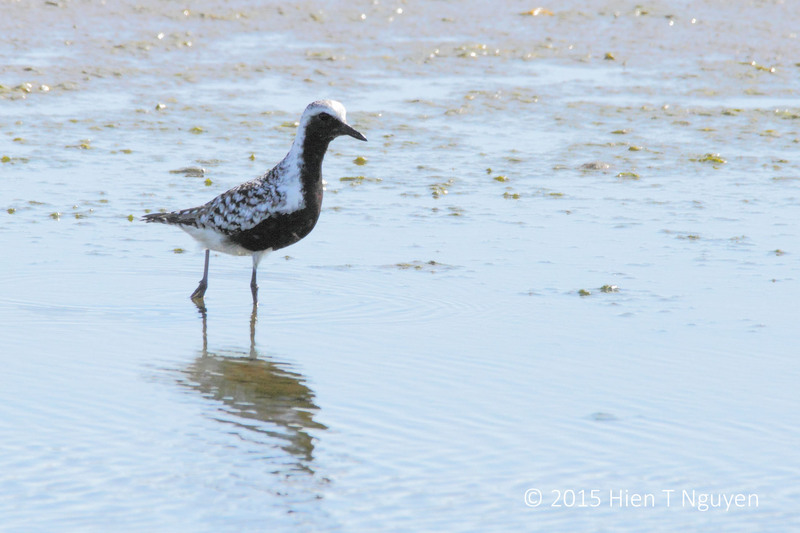 As its name implies, the Black-bellied Plover displays a black belly in breeding colors. Normally its belly is white. Black-bellied Plover in breeding plumage. 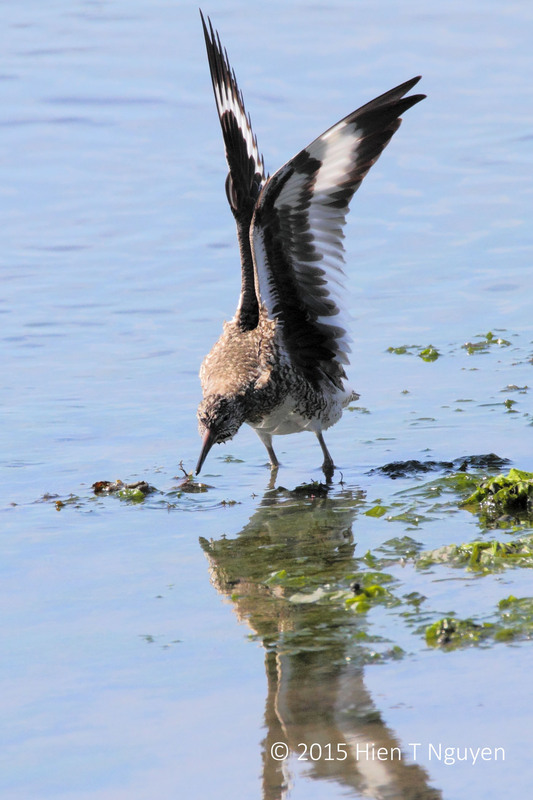 The Willet is of a gray dull color when it is not breeding, otherwise it is mottled brown and much more noticeable. Incidentally, in the 19th century people used to eat Willet eggs and meat for food, just like chickens. That brought this bird almost to extinction until the Migratory Bird Treaty Act of 1918 stopped that practice. 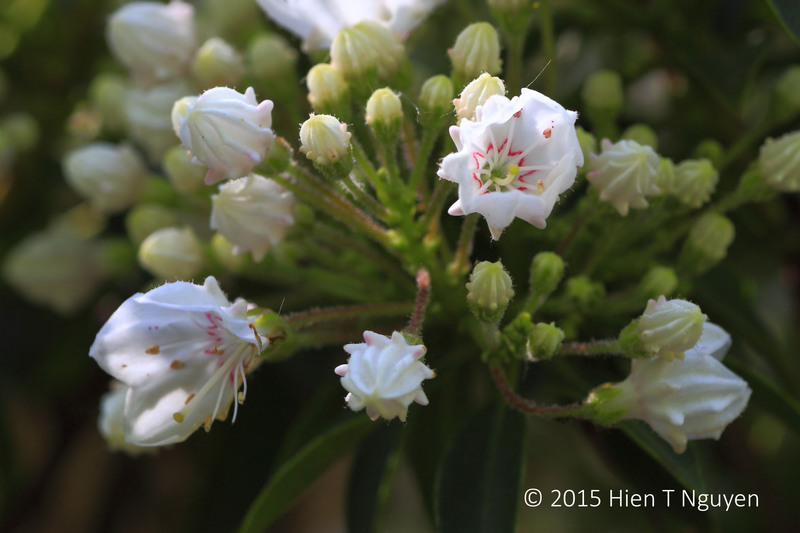 Now it is abundant again and very striking when it flies with blank and white stripes on its wings. The Great Egret is always white, but during breeding season it shows some green color on its face and it sports long plumes of feathers. 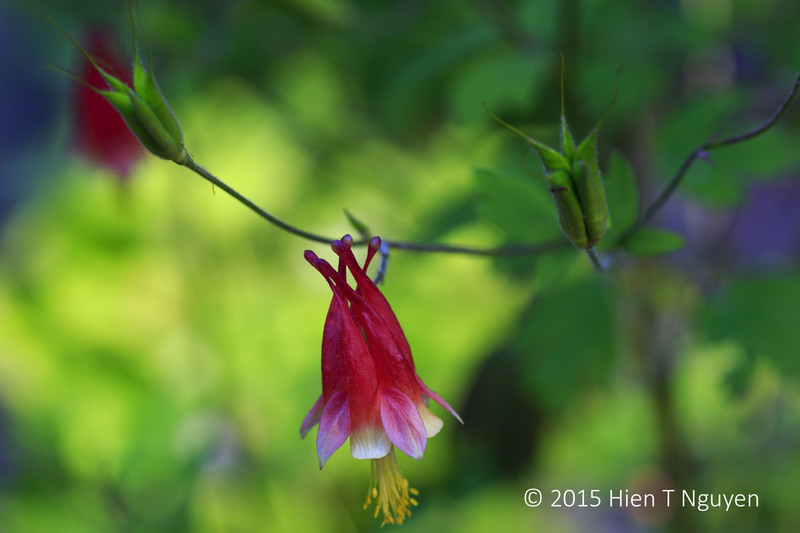 Those airgrettes used to adorn ladies’ hats in the 19th century. 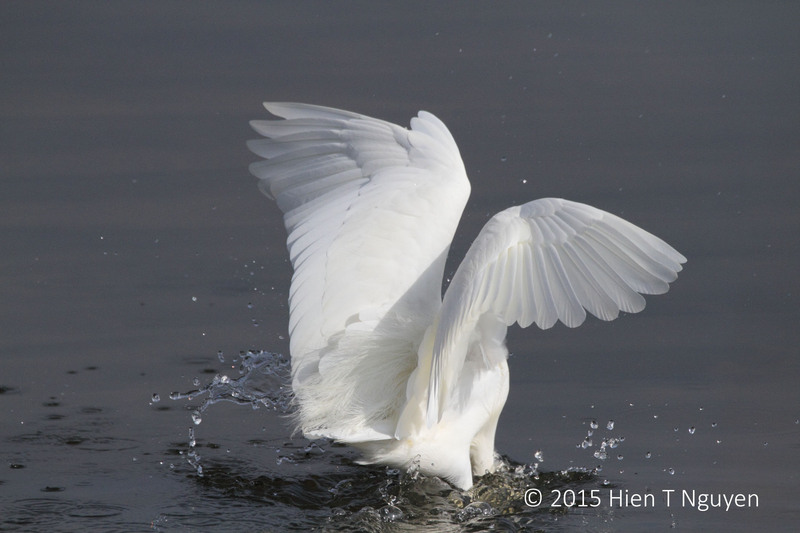 That fashion craze led to a serious decline in egret population until the fad was eventually banned. 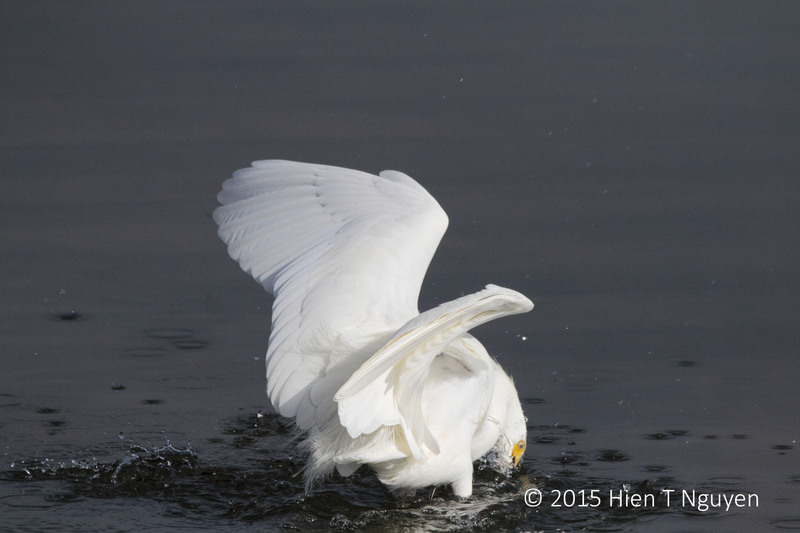 Great Egret with a successful jab at a fish. Note the green breeding color on its face, and the feather plumes. 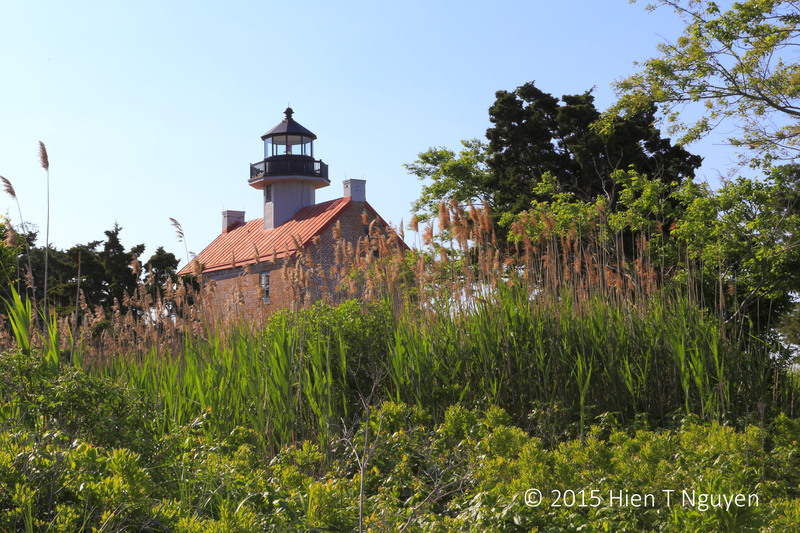 Looking for a photography subject that was not constantly moving like birds, I went to the East Point Lighthouse in Heislerville, NJ on the Delaware Bay near the mouth of the Maurice River. 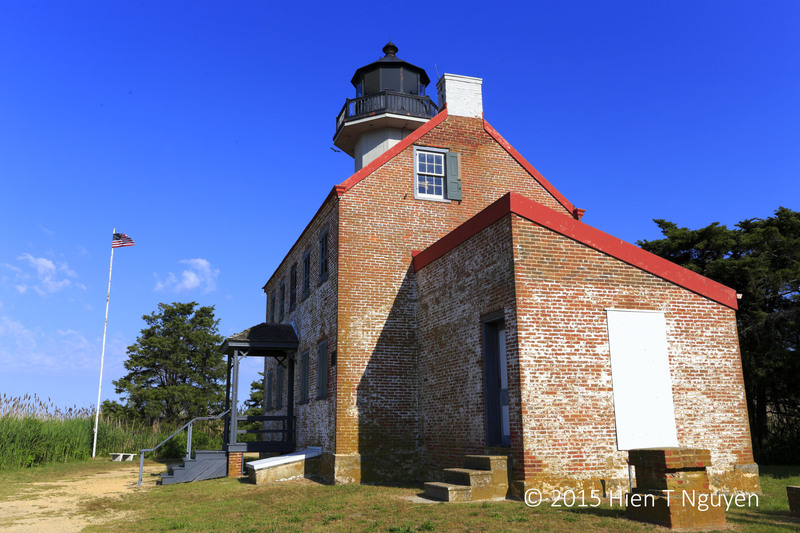 Built in 1849, it is the second oldest lighthouse in the state. It was partially destroyed by fire in 1971, restored in 1979, and reactivated in 1980. 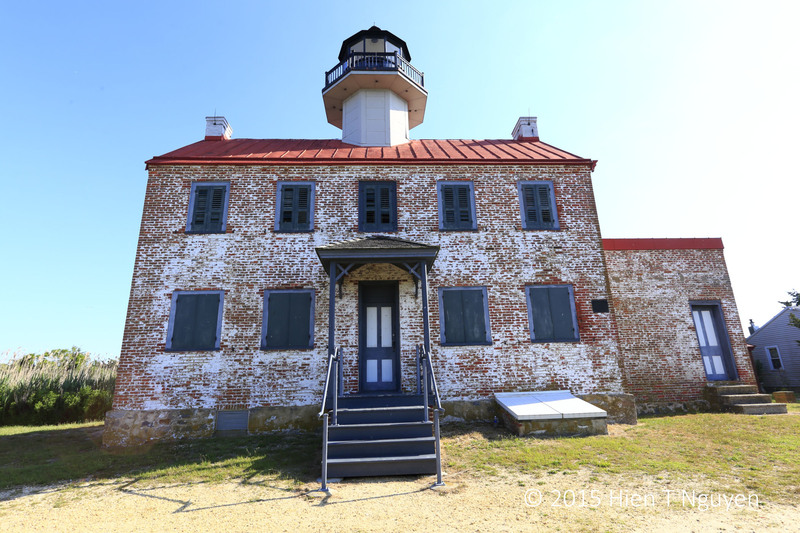 After Superstorm Sandy there has been some concern that the lighthouse may not survive the forces of nature unless something is done to reinforce the land surrounding it. The following scenes of the beach around the lighthouse show how close the ocean is and how easy it would be for another major storm to bring down the lighthouse. Beach at East Point Lighthouse. 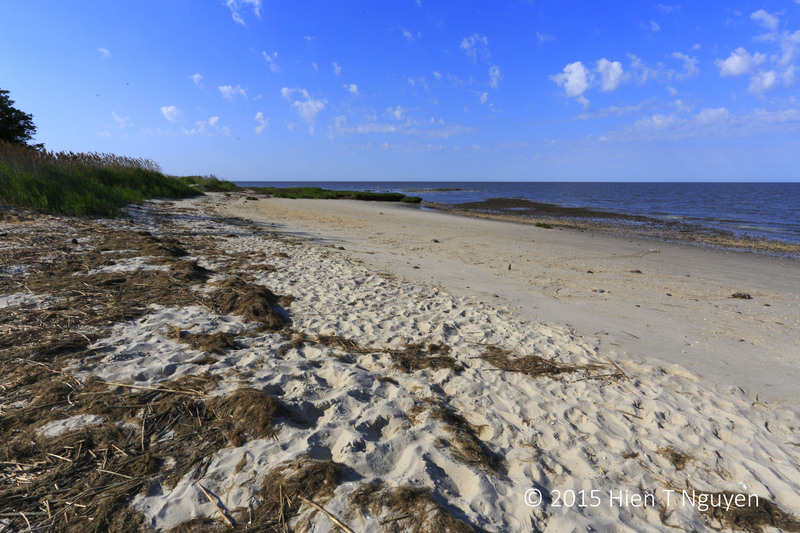 Look closely (click to enlarge) and you will see upturned horseshoe crabs on the sand. 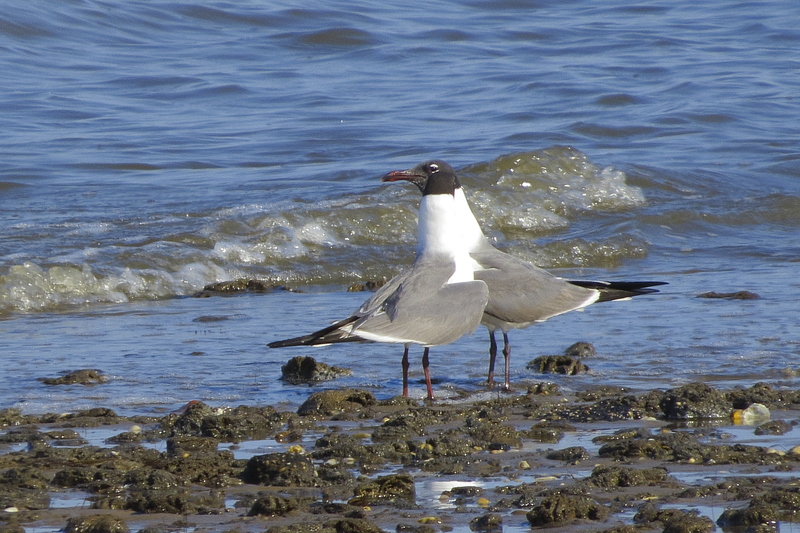 For this challenge, http://ceenphotography.com/2015/05/19/cees-fun-foto-challenge-pairs/, today I witnessed a pair of Laughing Gulls in breeding plumage standing apart from all the thousands of other birds at the narrow beach in Heislerville, NJ on Delaware Bay. The two only paid attention to each other and did not join the other birds in their annual feast of horseshoe crab eggs at this time of the year. 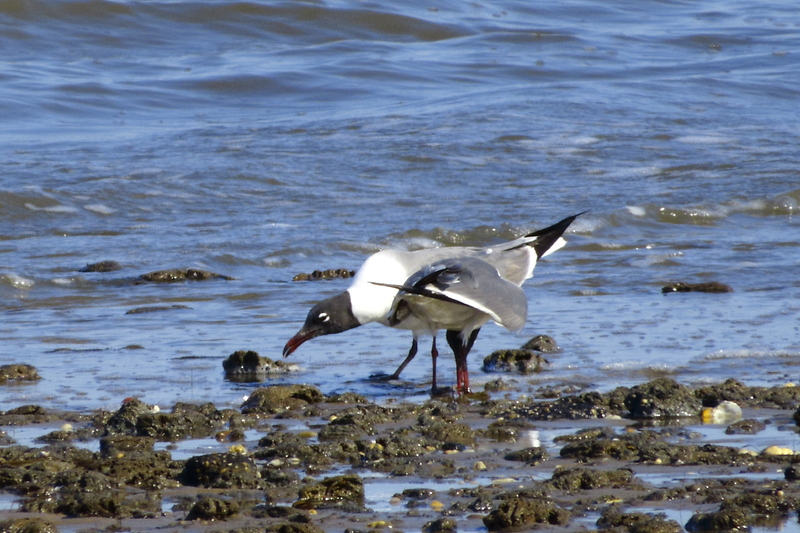 Laughing Gulls: their heads are black when they are breeding; otherwise they would be gray. 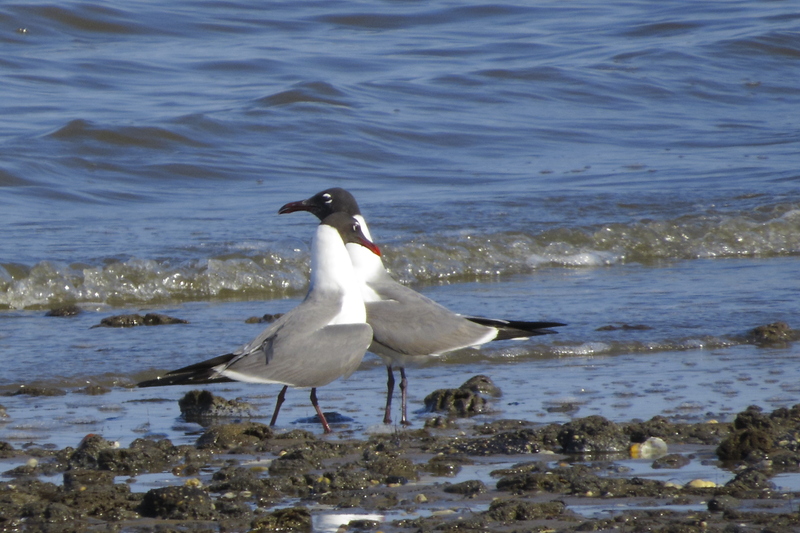 Laughing Gulls: she nuzzled against him. 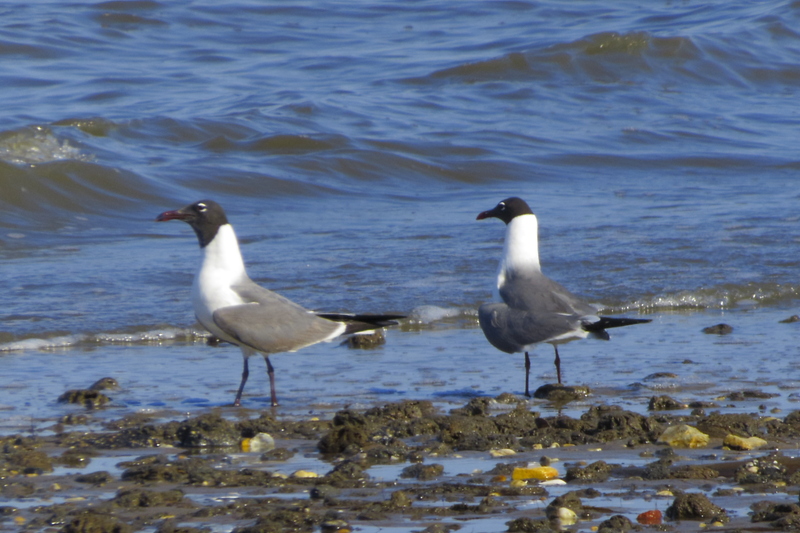 Laughing Gulls: what did she whisper to him? Lauhing Gulls: they kept looking for food together, away from the crowd. 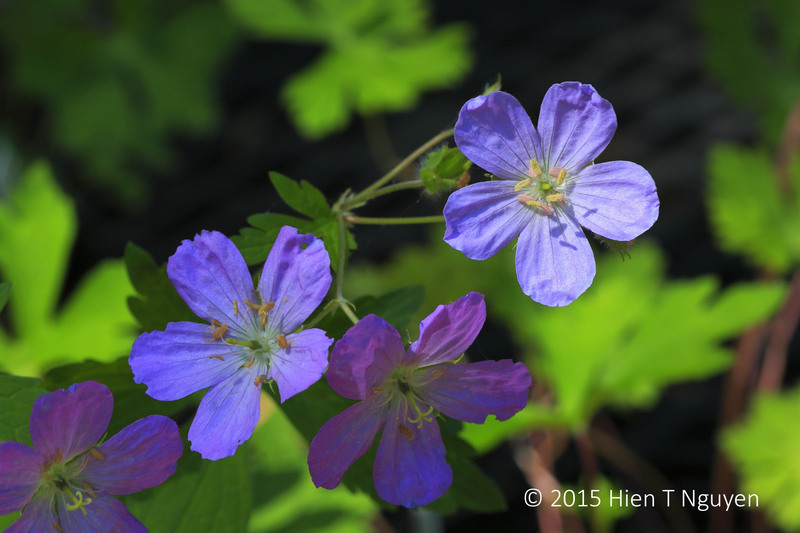 I went to the Bowman Hill’s Wildflower Preserve in New Hope, PA today and took the following photos of some of the wildflowers blooming there at this time. 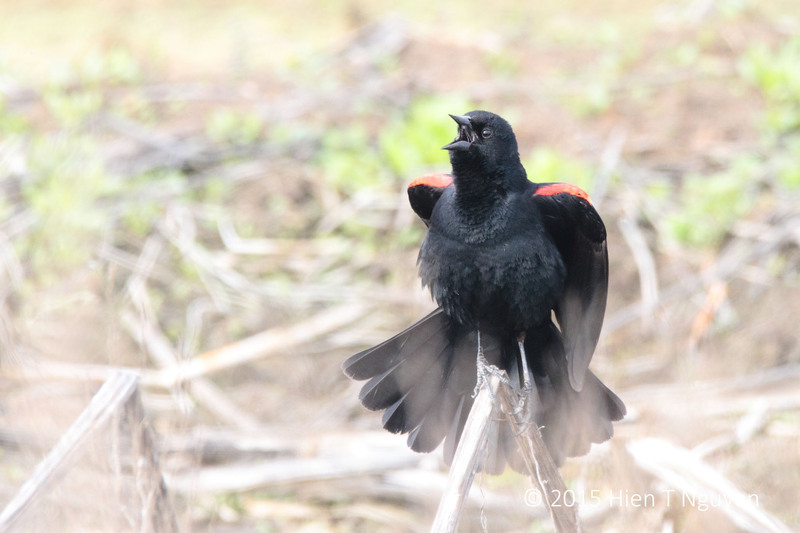 The Red-winged Blackbird, an ubiquitous bird in North America, likes to sing. The other day I saw and heard one belting out a famous aria. 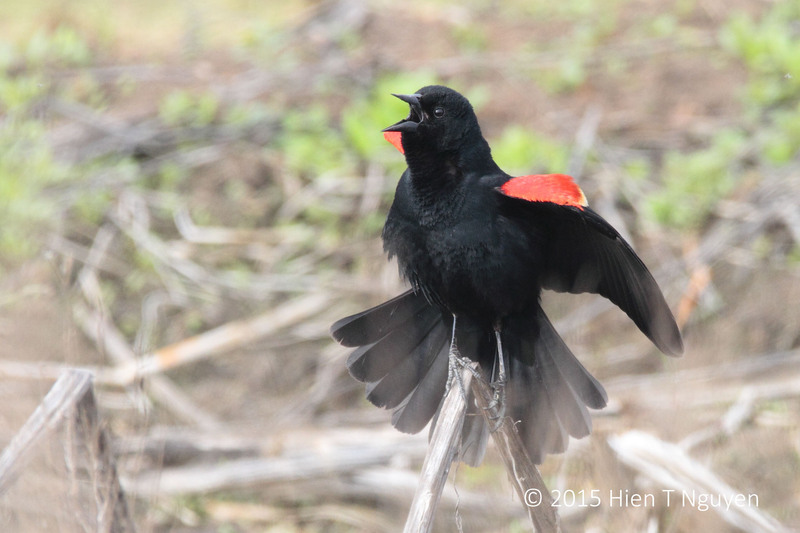 Red-winged Blackbird tenor coming on stage. He looked right. He looked left. 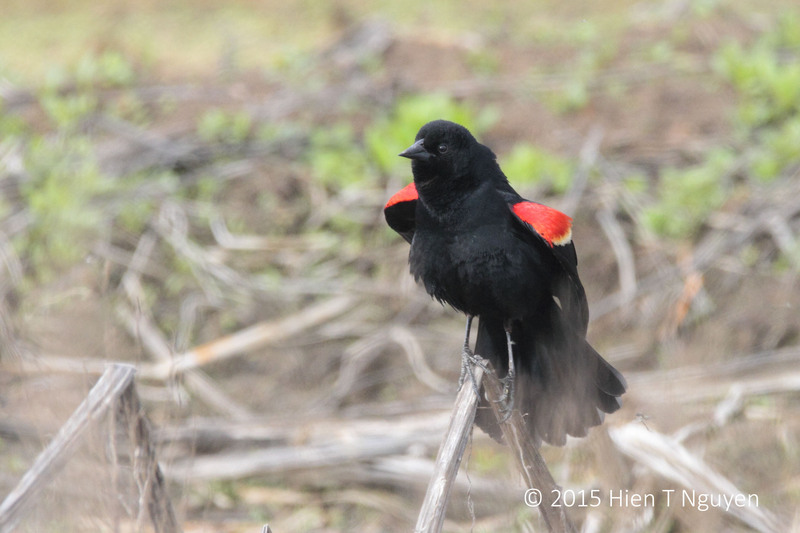 Female blackbirds were getting their handkerchiefs ready. He paused briefly. 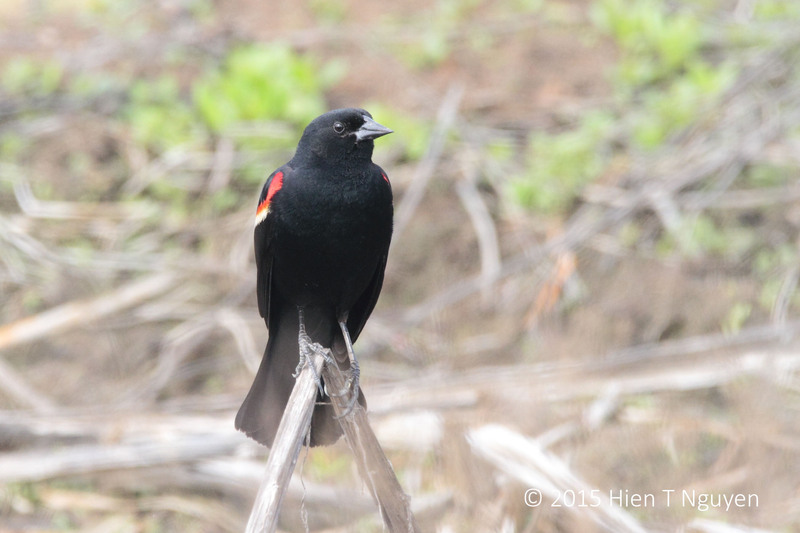 Female blackbirds were sobbing. 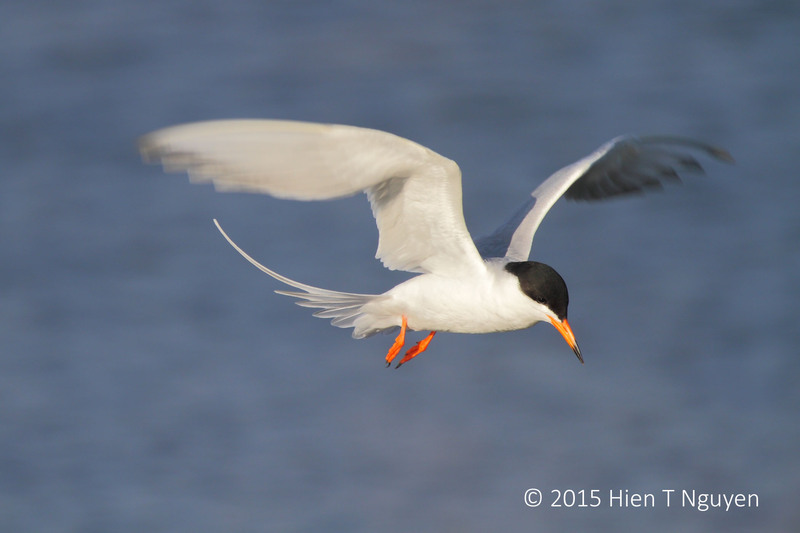 Forster’s Terns like to hover above the salt marshes, making quick, unpredictable turns before diving into the water to catch something to eat. They can be real aerial acrobats as shown in the following photos taken at the Edwin B Forsythe National Wildlife Refuge a few days ago. 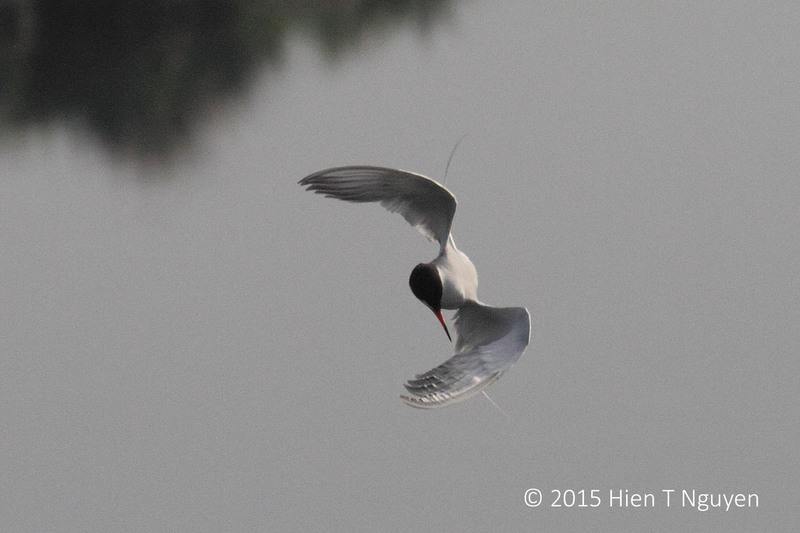 Forster’s Tern flying above the marsh. 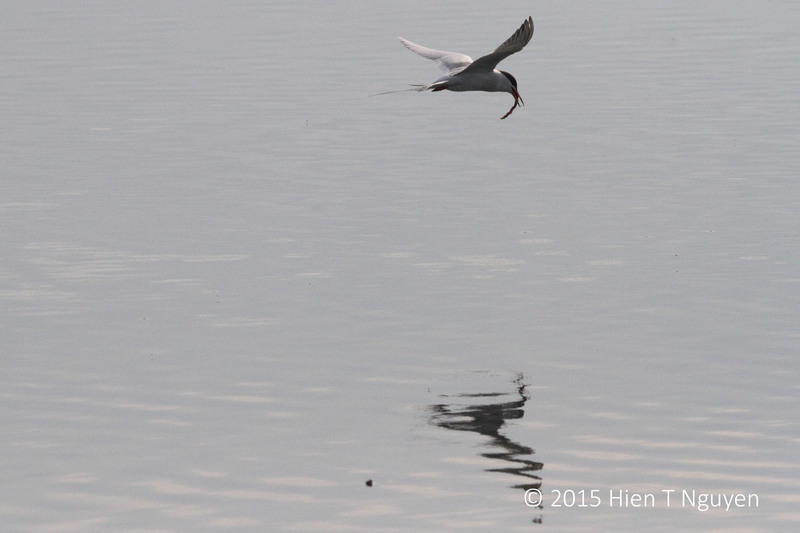 Forster’s Tern flying away with a catch. 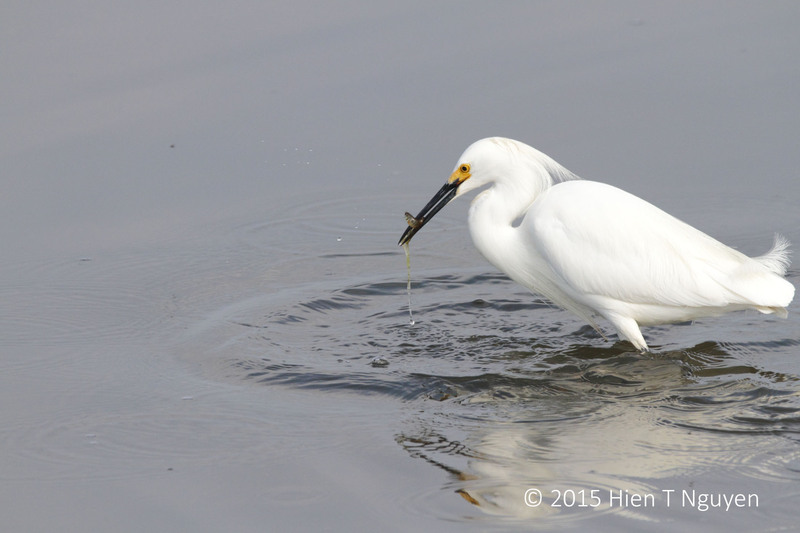 The Snowy Egret is one of the most beautiful birds to watch, even when it is trying to catch a fish, as shown in the following photos taken yesterday at the Edwin B Forsythe National Wildlife Refuge. 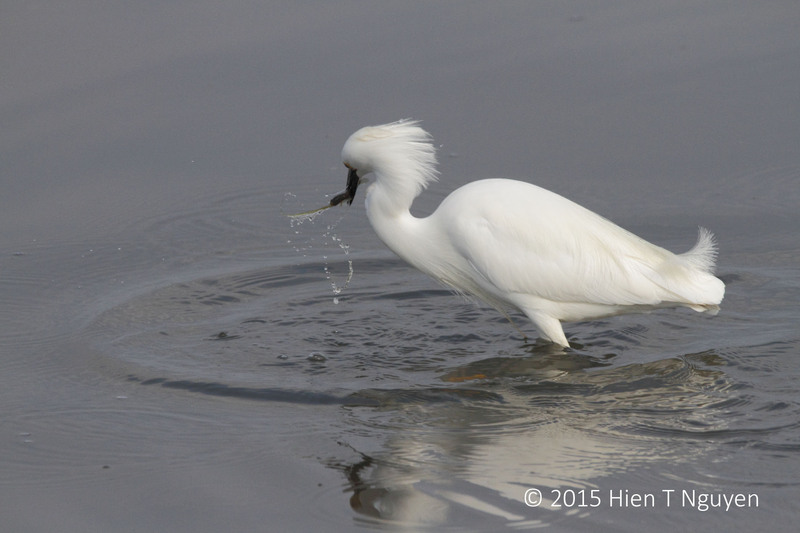 Splash: a Snowy Egret diving after a fish. 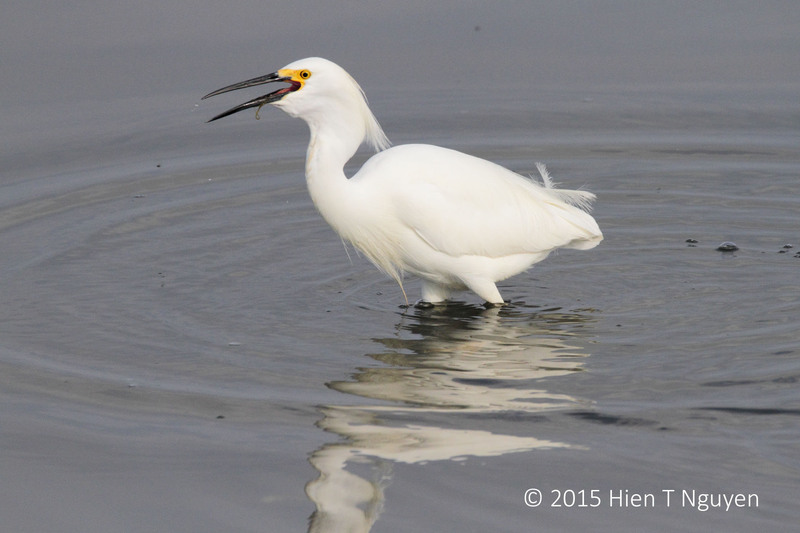 Snowy Egret looking for a fish. 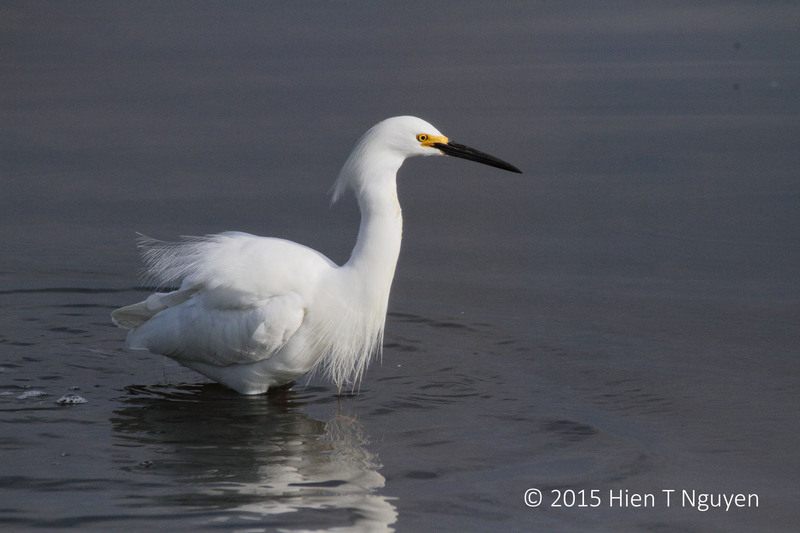 Snowy Egret: Sigh, that one got away… I have to do better than that. Two minutes later: Caught one! Fish, you are not getting away, no way! Ah, that tastes so good! 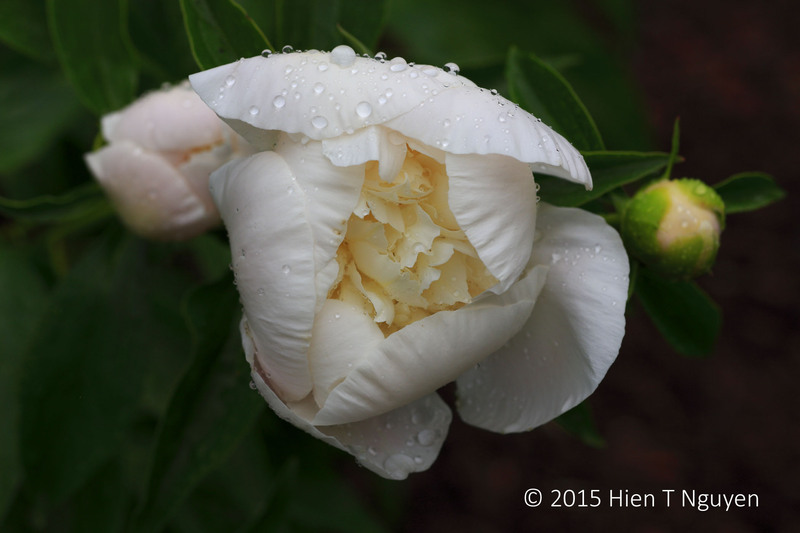 JeanInJackson post Only Child prompted me to post this photo I took today. 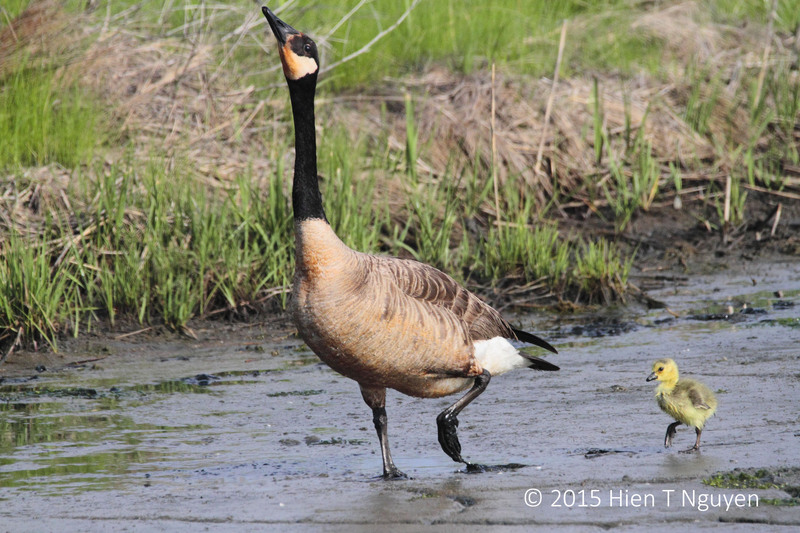 Canada Goose mother: He’s my only child! He’s mine! 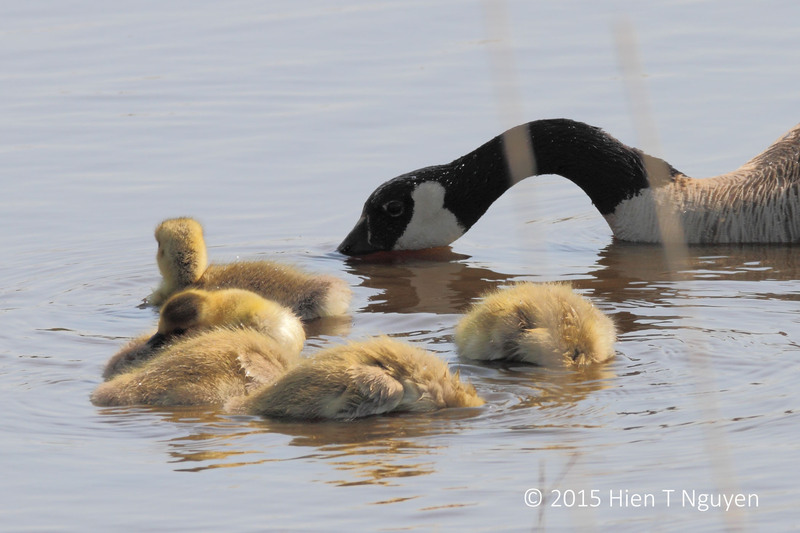 Meanwhile, at another part of the Edwin B Forsythe National Wildlife Refuge, five goslings were being taught to look for food by their mother. Goslings being taught to look for food. 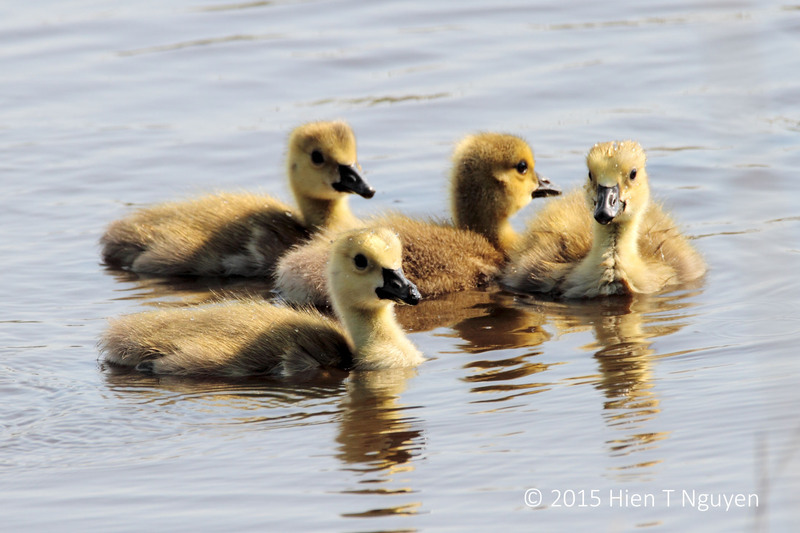 Here’s another view of four of the goslings. 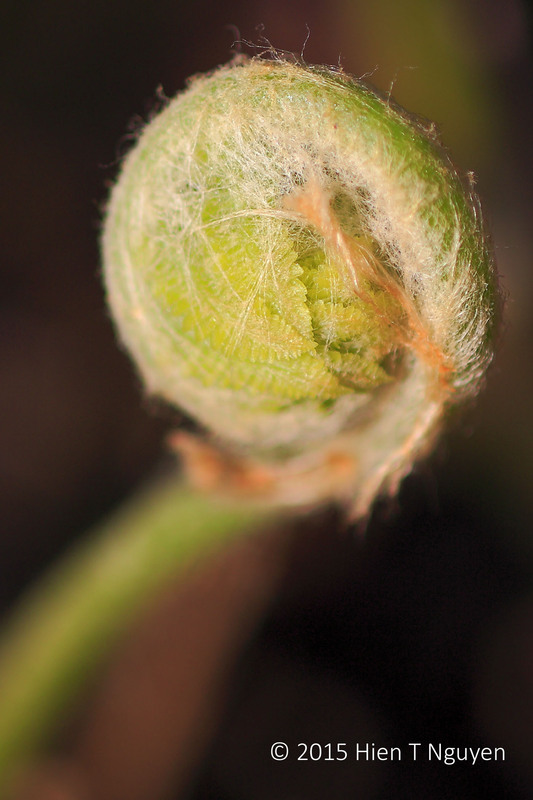 This challenge, https://dailypost.wordpress.com/dp_photo_challenge/enveloped/, made me initially wonder how to illustrate “enveloped” with photos. 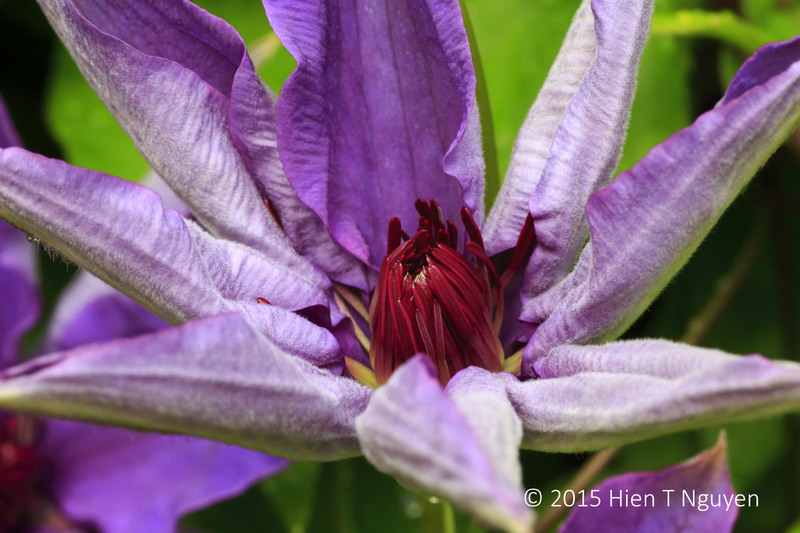 However, this morning I went out to check our clematis vines after last night’s rain and I saw that many flowers had escaped from their envelopes like the one shown below. 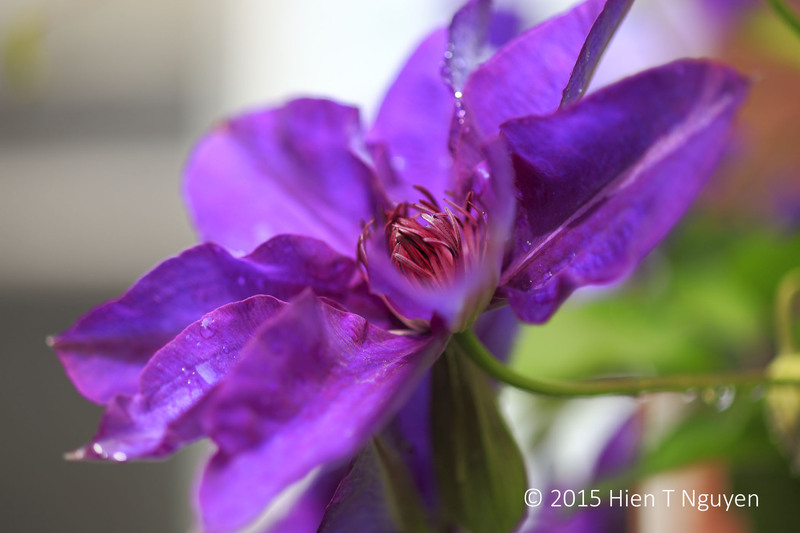 The blooms, laced with rain drops, were of all shapes, sizes, and variations of purple. 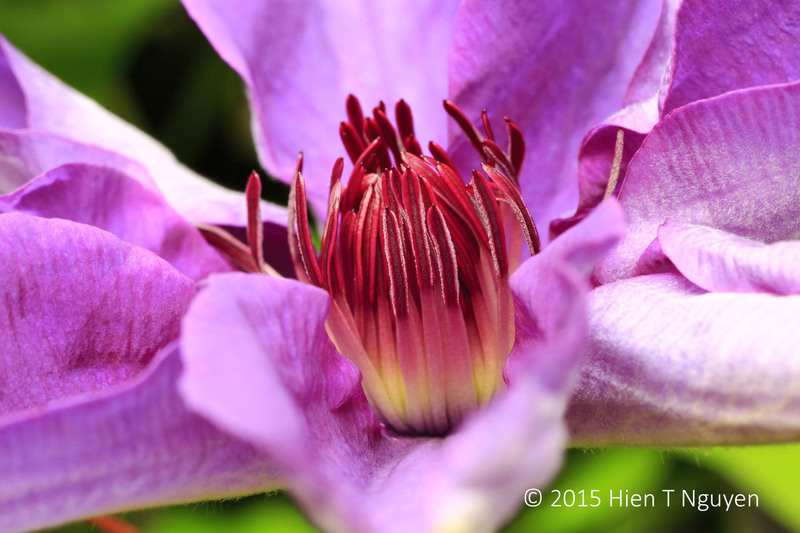 All of these flowers come from the same vines planted 28 years ago. 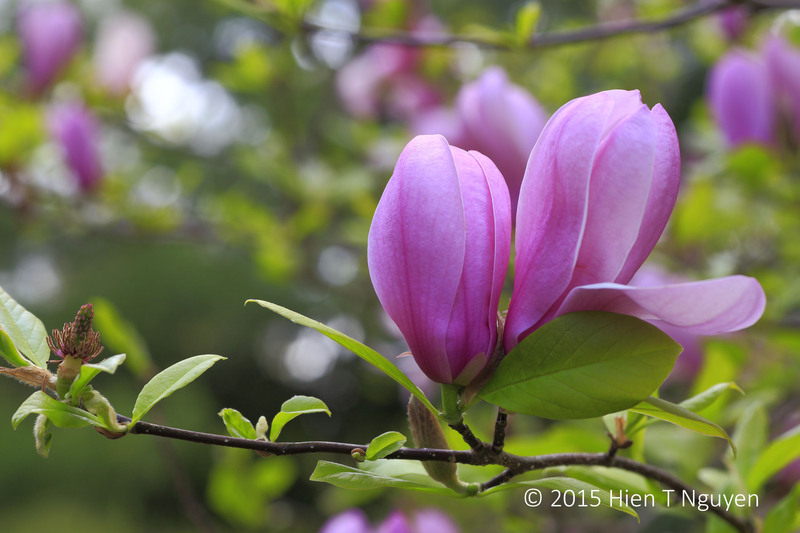 It blooms faithfully year after year. 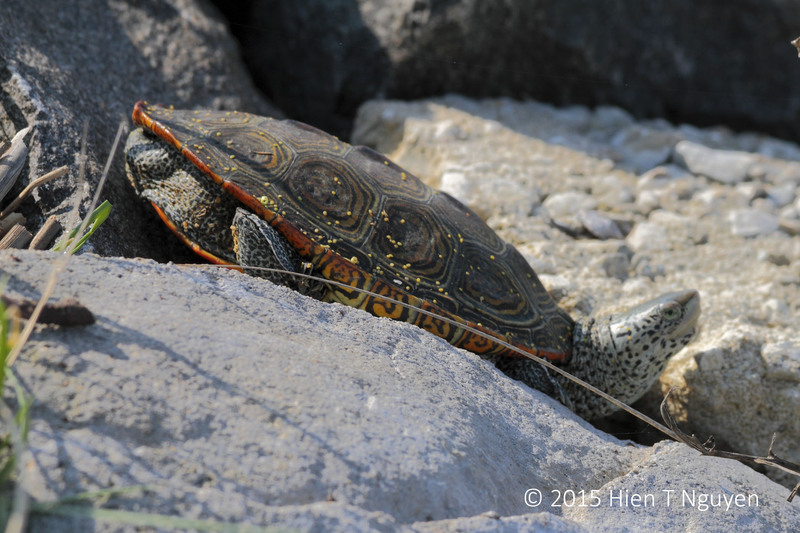 A Diamondback Terrapin crossed Wildlife Drive at EBF right in front of me. It stopped and so did I to grab my camera and take the following pictures. As soon as it saw me get out of the car, the turtle scurried to hide behind some rocks. 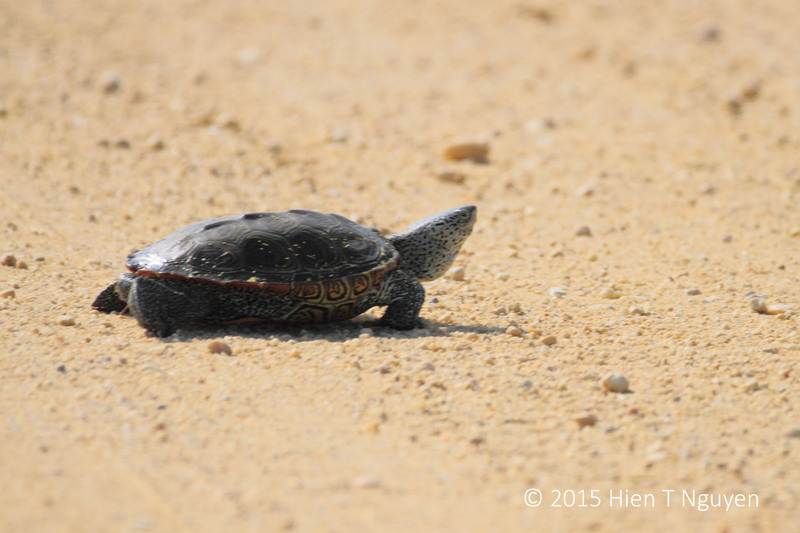 Diamondback Terrapin crossing the road. Diamondback Terrapin trying to hide. Time between the two shots: 12 seconds. 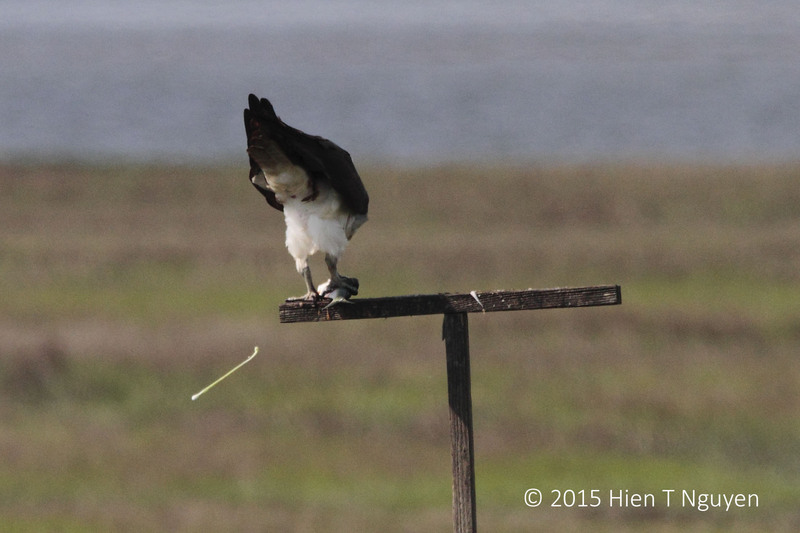 While photographing the pair of Ospreys sharing a meal, I kept hearing a loud “wheep” every few seconds. 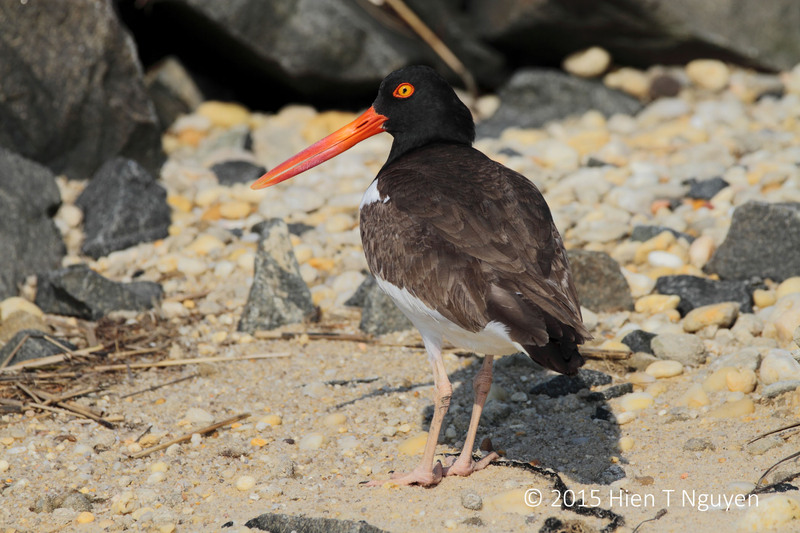 The source of the noise was an Oystercatcher, a large shore bird I had not seen up to this point. 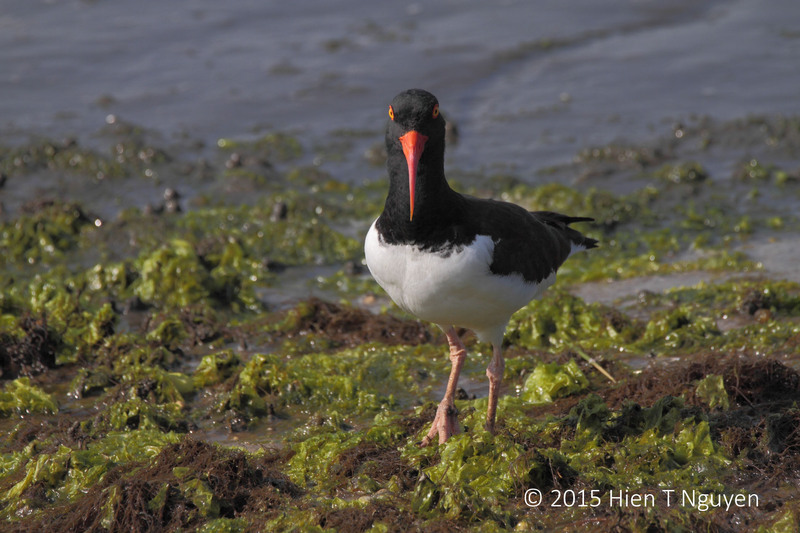 Oystercatcher whistling its “wheep” sound. Here are more images of the companion bird to the above. Maybe they were a couple. 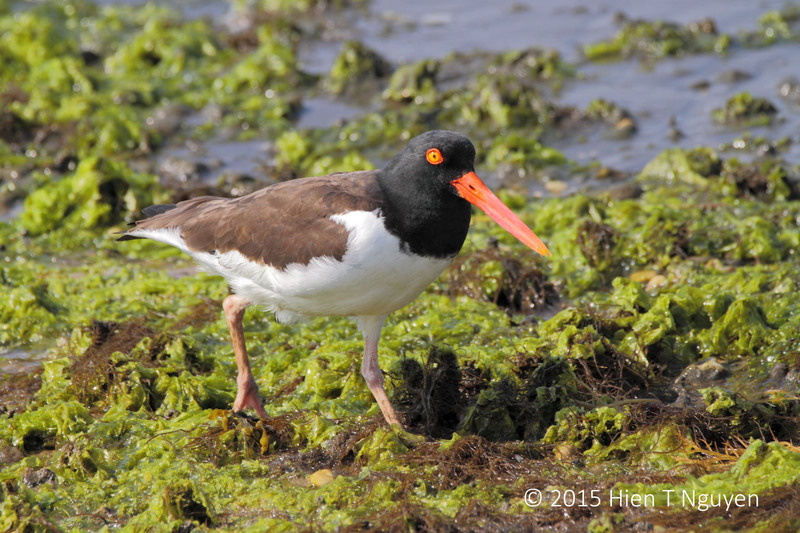 Oystercatcher searching for shell fish, like oysters or clams. Oystercatcher wondering about the guy with a tripod. 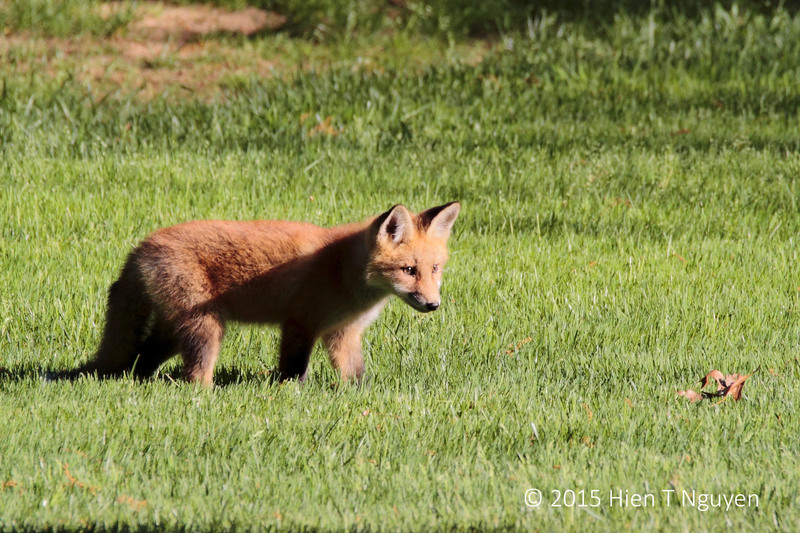 Five red fox pups have made an appearance in our backyard this spring. 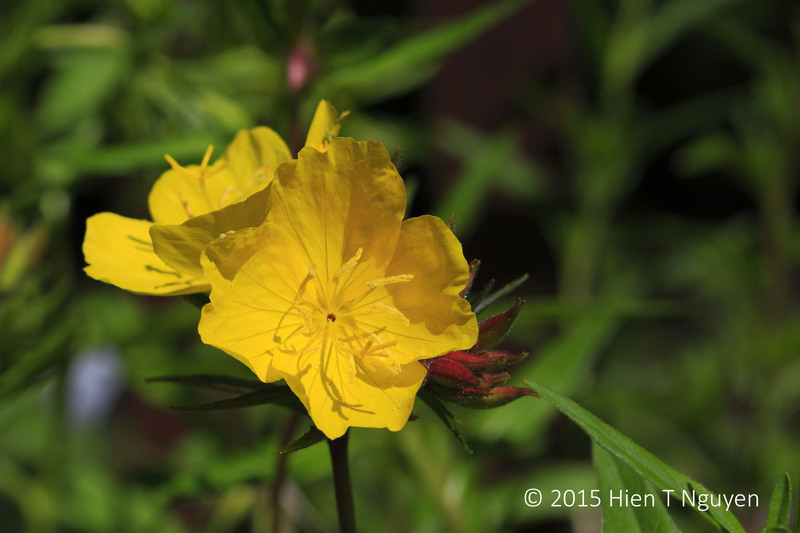 In early morning or late evening, they come out, play, look around, run and chase one another. 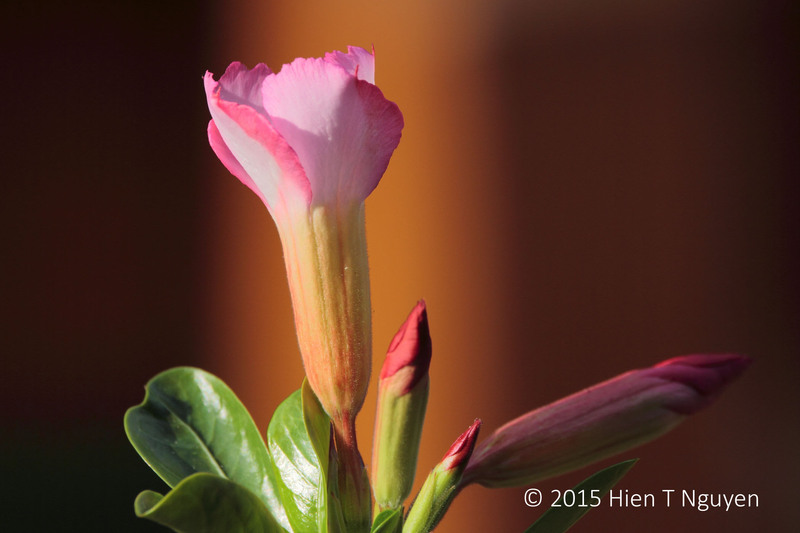 I took the following photos from our deck, and so far they don’t seem to mind. 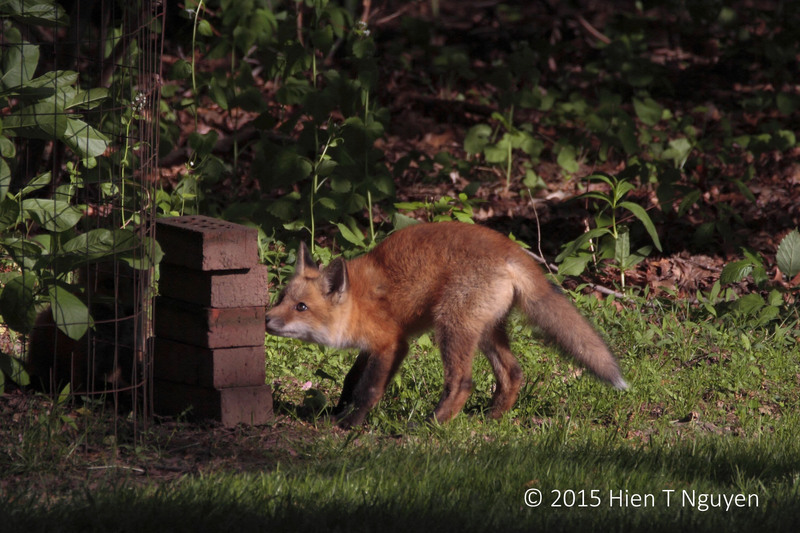 Red fox pup checking out some bricks I had recently cleaned. There is another one partially hidden on the left. Red fox pup play acting with a dried leaf, pretending it is a rodent. 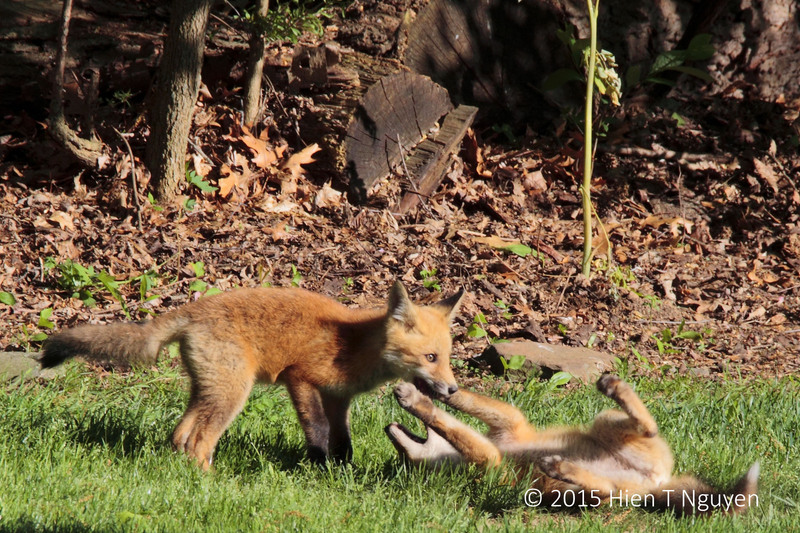 Two red fox pups wrestling. 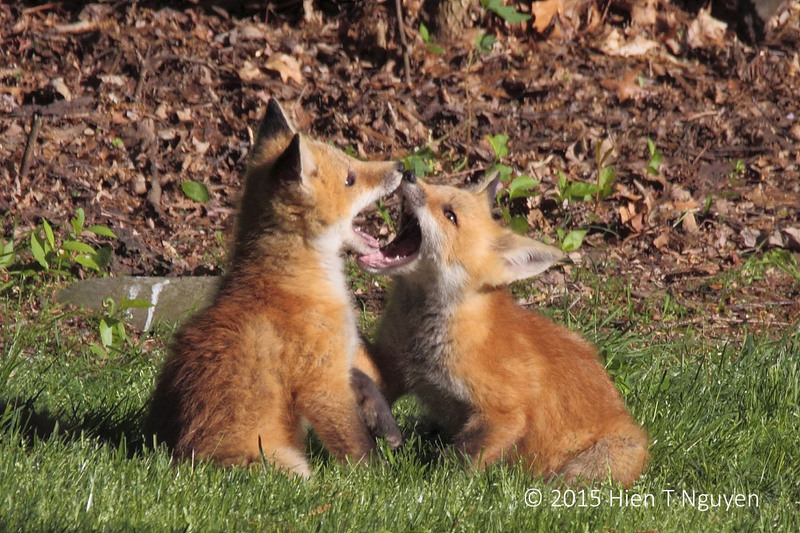 The same two red fox pups mimicking aggression. 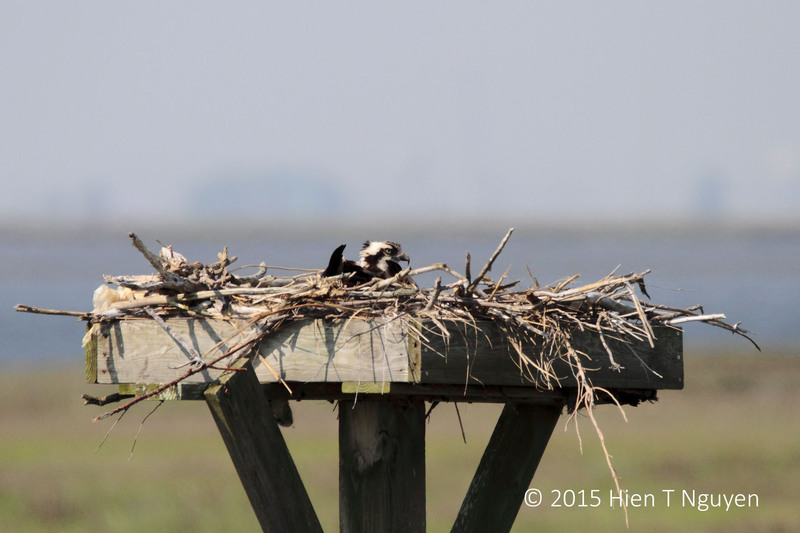 Yesterday at the Edwin B Forsythe National Wildlife Refuge I stopped to check on an Osprey couple. 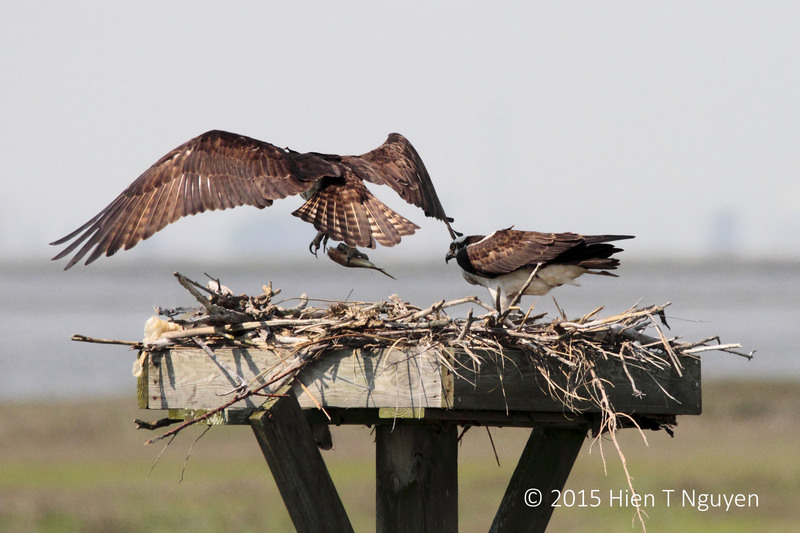 At the same time, the male Osprey flew back to the nest with a sizable fish in his claws. 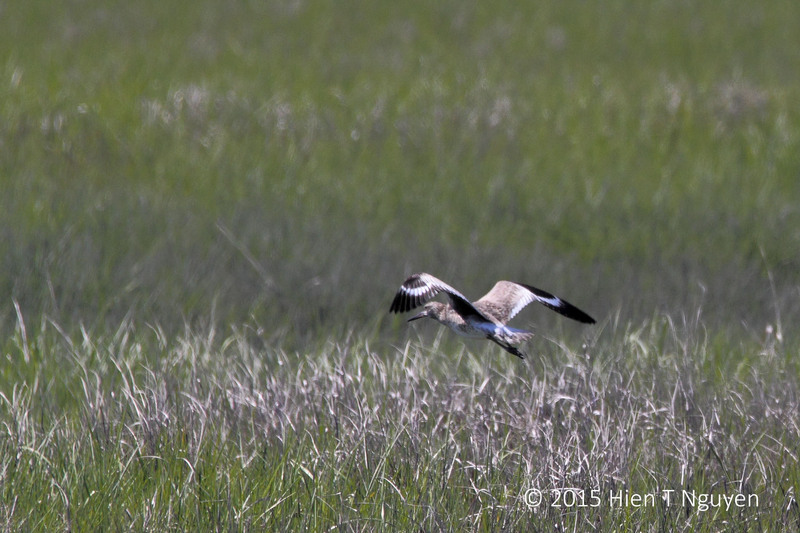 He glided by the female who was sitting in the nest incubating. Then he went to a perch and proceeded to eat the head of the fish. 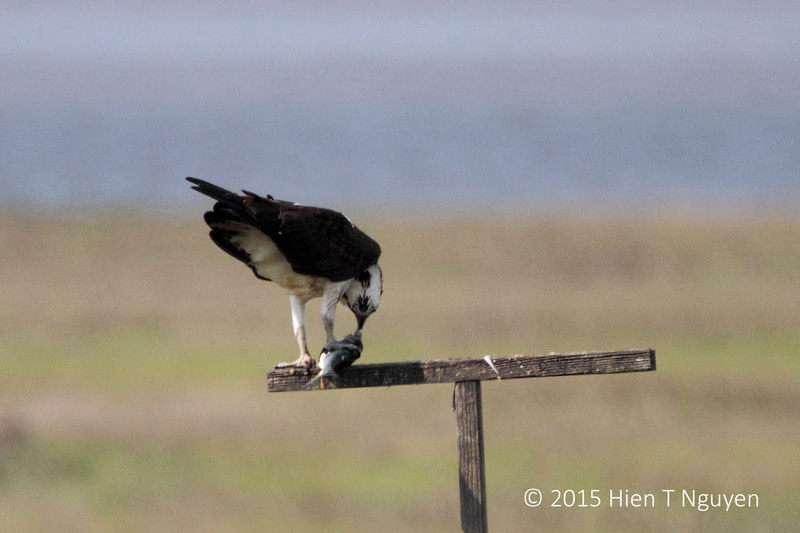 Male Osprey eating fish head. After about 15 minutes, the male Osprey probably had its fill, stopped eating and defecated! Then he took the fish to his patient mate. 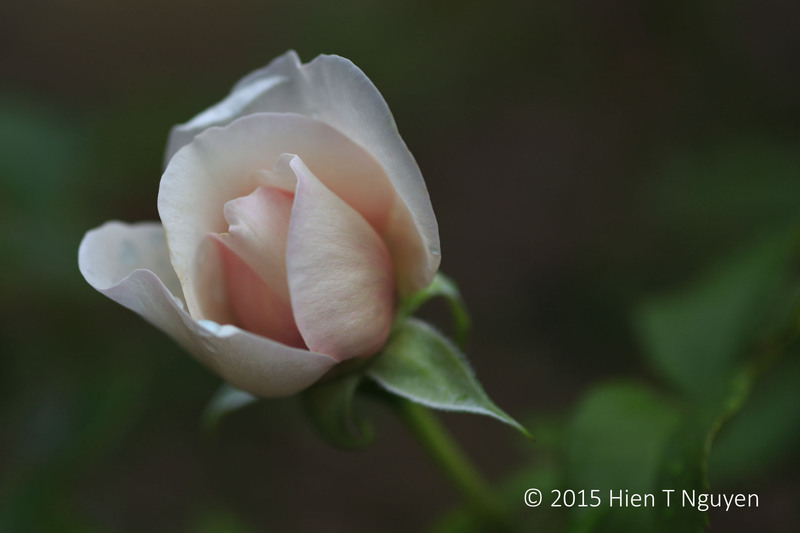 She saw him flying to her and rose up in their nest. He gave her the fish. 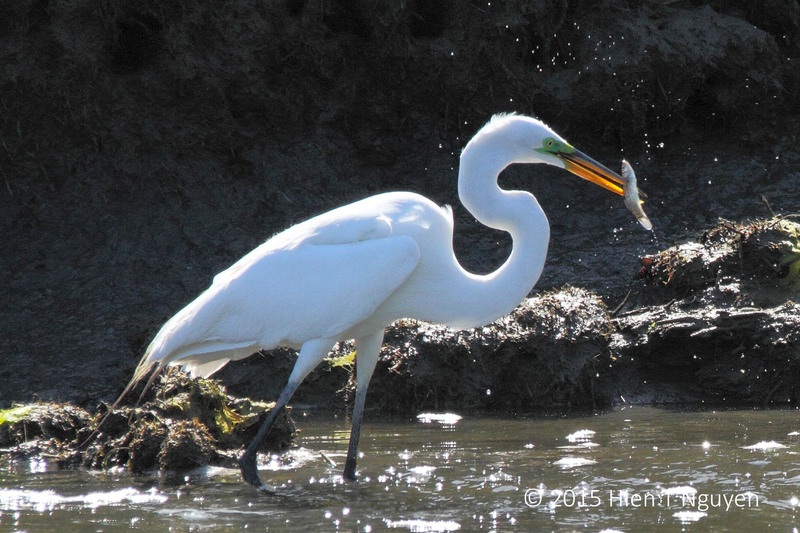 She grabbed what remained of the fish and flew away to the same perch he had used. 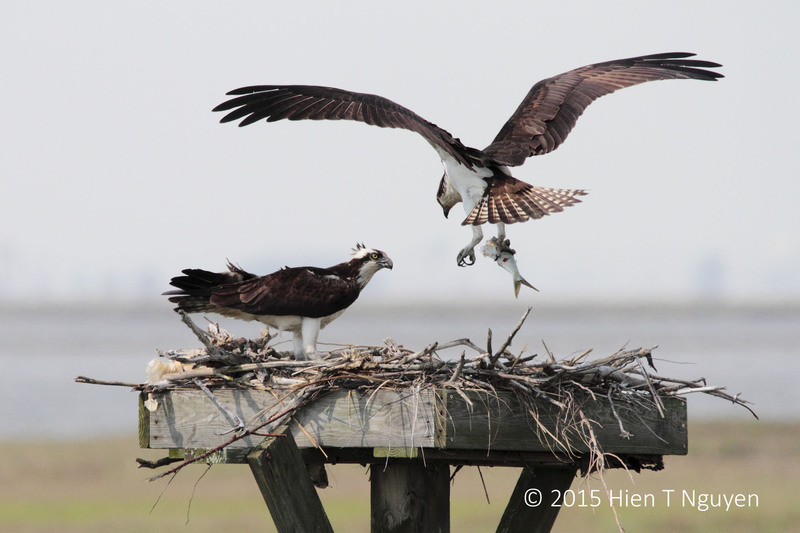 Female Osprey leaving nest with fish. 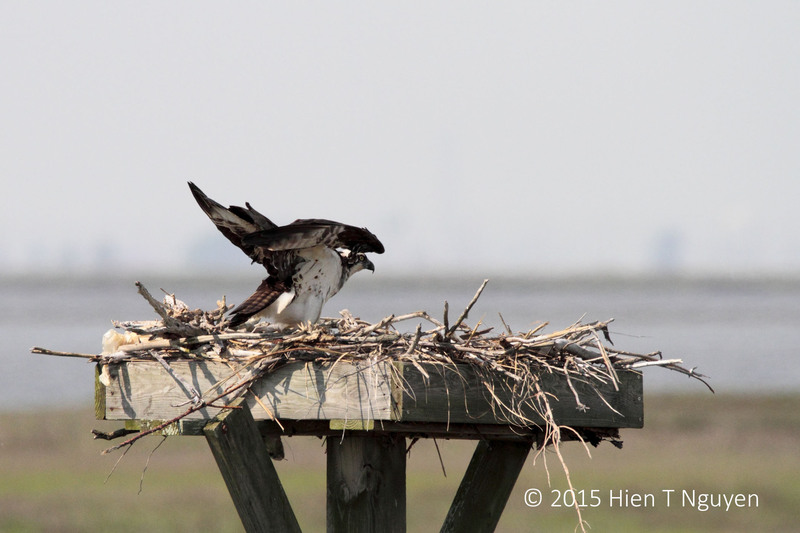 At the perch, before she ate, she looked back one more time to make sure that he was going to sit on their eggs. 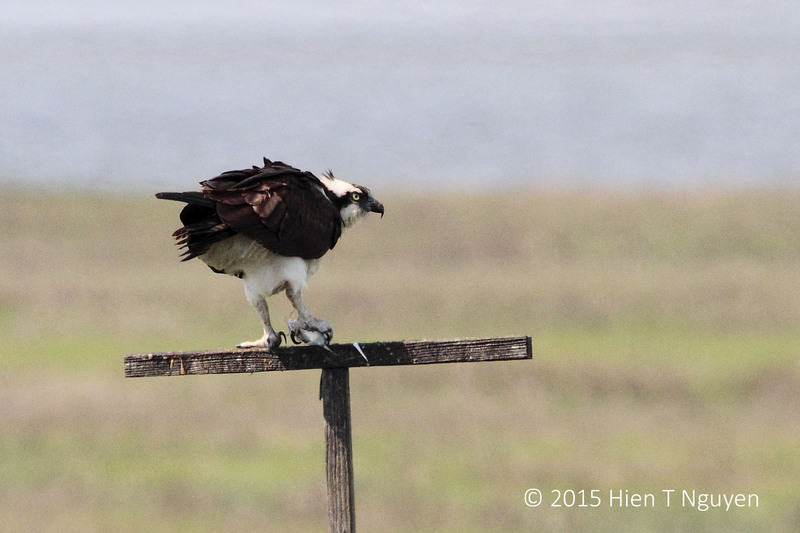 Female Osprey checking on her mate before eating: Dear, are you sitting down? He of course sat down and took his turn incubating. 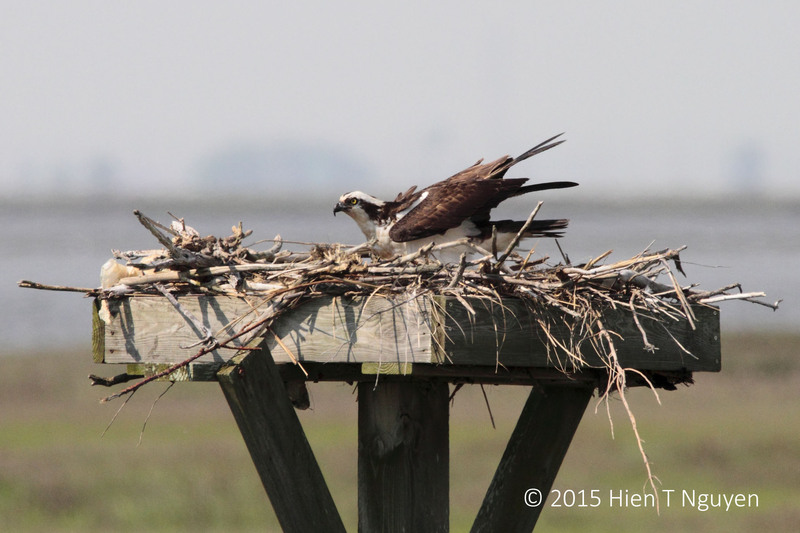 Male Osprey preparing to incubate: Don’t worry honey, I am doing my part. Only then did she start eating. 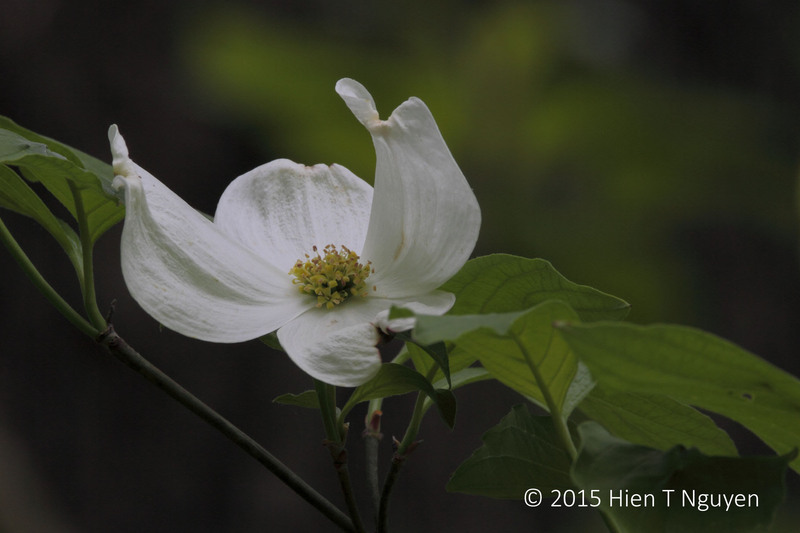 Dogwood flowers are a marvel of nature, with lines gracefully curved, so simple yet so beautiful. 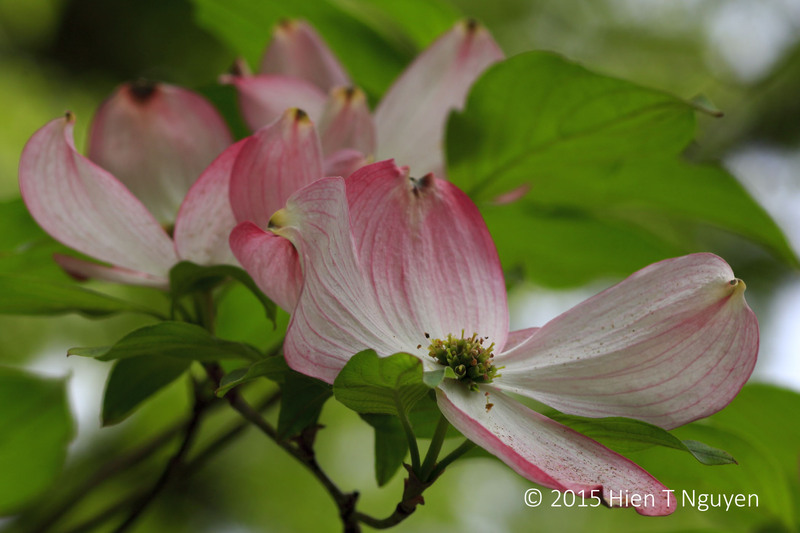 Spring is the season of dogwoods, and many are blooming in our area. 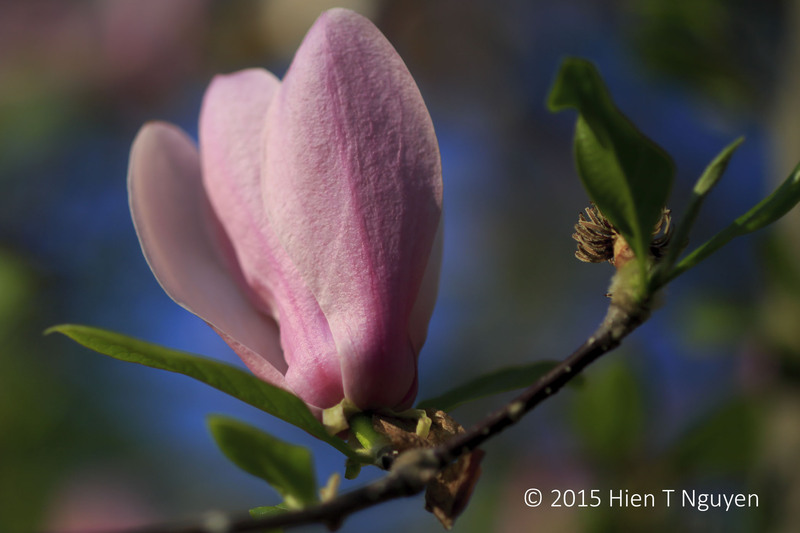 Today I went out and took pictures of pink and white dogwood flowers, the latter from our backyard. 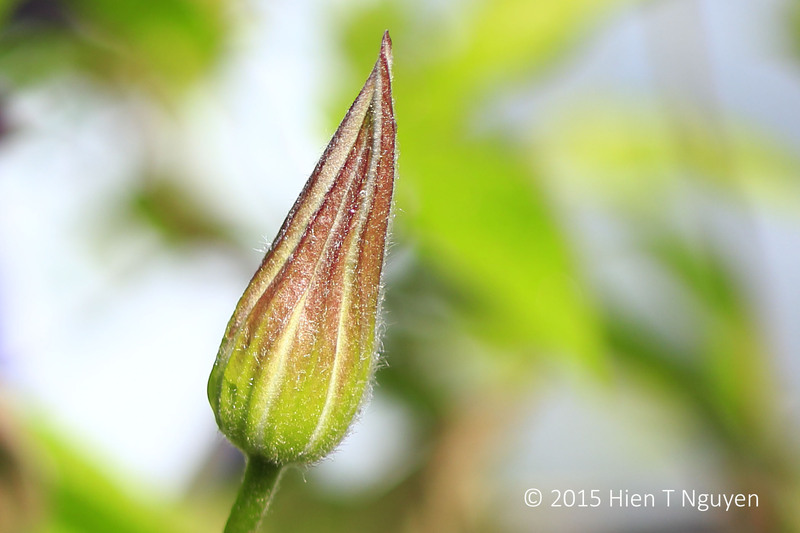 By the way, pink dogwoods are becoming increasingly rare due to a fungus disease, Dogwood Anthracnose. 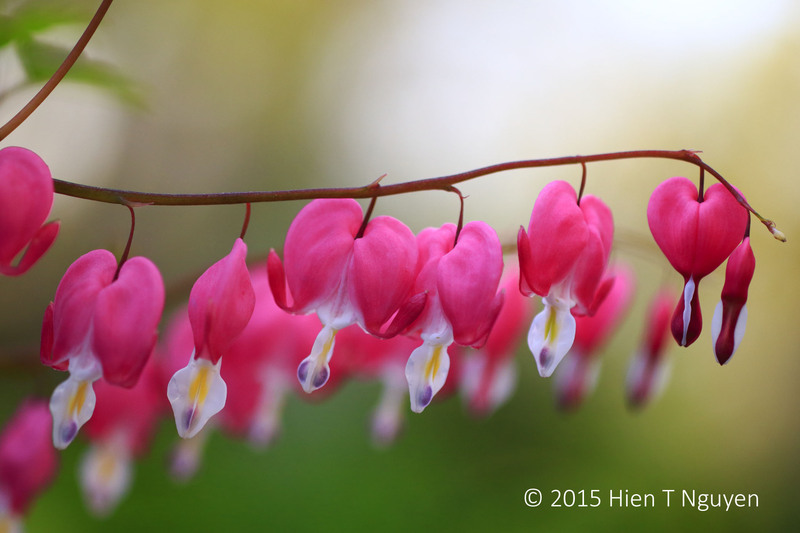 Bleeding Hearts are in full bloom around the house and this morning they were good to photograph from any angle. 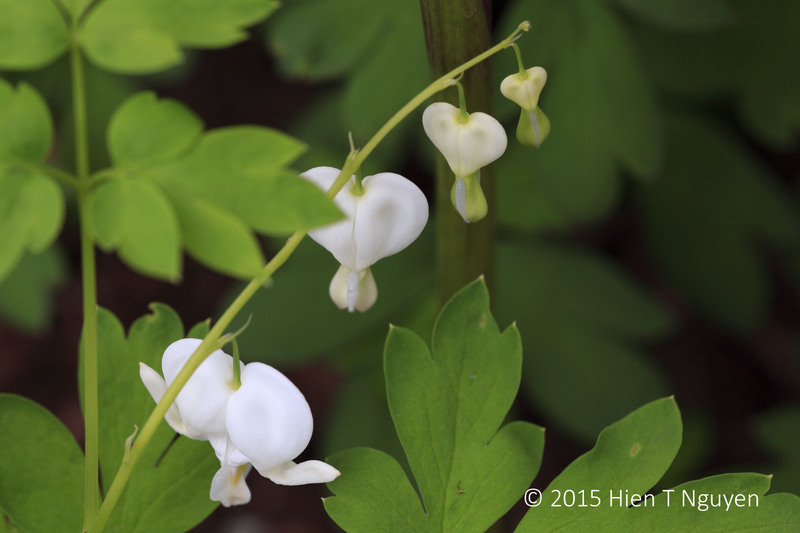 Bleeding Hearts: I need a hug! 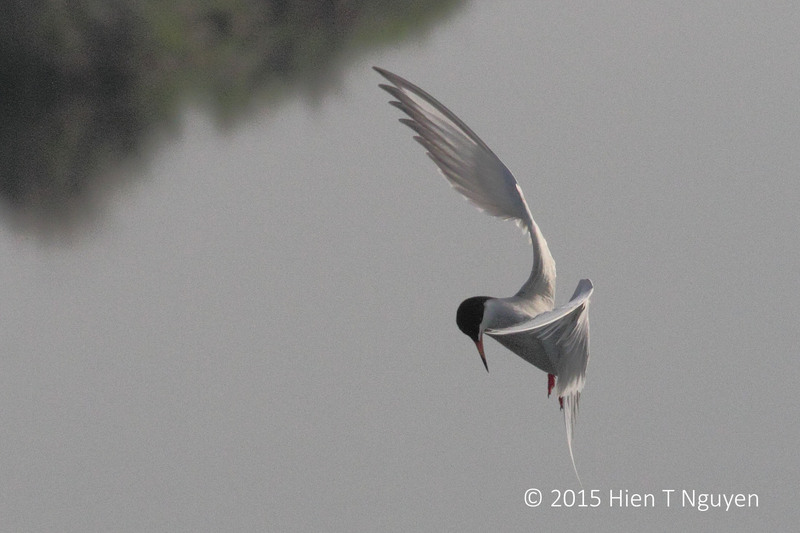 This time of the year Forster’s Terns are a common sight at EBF. Last week I stopped my car when I saw more than a dozen of them hovering in the air and diving into a pond to catch fish. 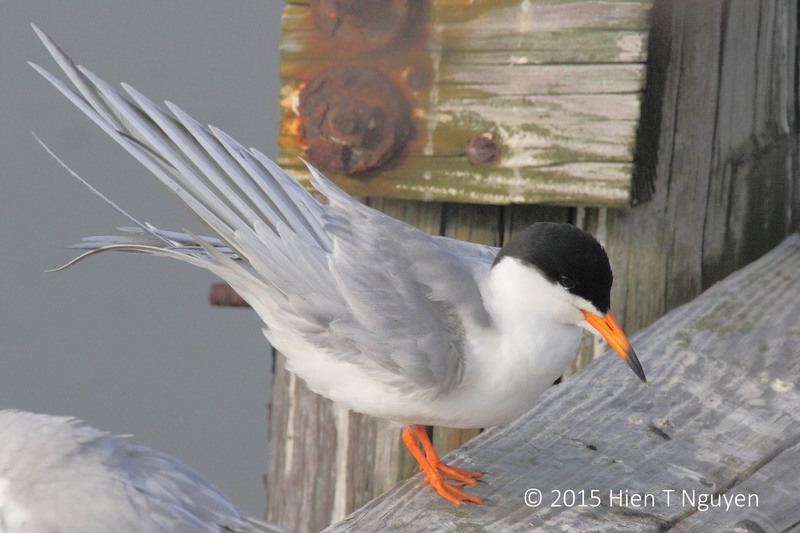 The terns ignored me and went on with their aerial acrobatics as if no one was around. In the following photo this tern was hovering, flapping its wings but its eyes were fully concentrated on any prey lurking beneath the water.